Definition at line 30 of file polytest.cpp. Definition at line 33 of file polytest.cpp. Definition at line 25 of file polytest.cpp. Definition at line 21 of file polytest.cpp. Definition at line 28 of file polytest.cpp. Definition at line 221 of file polytest.cpp. Definition at line 60 of file polytest.cpp. Definition at line 67 of file polytest.cpp. Definition at line 56 of file polytest.cpp. Definition at line 27 of file polytest.cpp. Definition at line 19 of file polytest.cpp. Definition at line 68 of file polytest.cpp. Definition at line 167 of file polytest.cpp. Definition at line 58 of file polytest.cpp. Definition at line 20 of file polytest.cpp. Referenced by AddDlg_OnCommand(), AdvAppearanceDlgProc(), ApplyRegistryValues(), blend_colors(), brush_fill_pixels(), ButtonProc(), ChangeSelectedMode(), CMenuToolbarBase::ChangeTrackedItem(), CheckListWndProc(), CheckTerminalDeviceType(), ClearCommandLine(), cmd_start(), COMBO_WindowProc(), COMBOEX_SetCursel(), comp_PageByHash(), ConMsgPrintf2V(), ConMsgPrintfV(), ConMsgPuts(), ConResMsgPrintfExV(), ConWrite(), CPlApplet(), CreateKeyboardLayoutList(), CRYPT_AsnEncodeInt(), d3dx9_base_effect_get_int(), DecodeInt(), DibLoadImage(), DisplayDeviceProperties(), DrawHands(), EDIT_PaintText(), EDIT_WindowProc(), EditWndProc_common(), CCharMapWindow::EnumDisplayFont(), EnumFontNames(), Execute(), ExecuteIf(), ExecutePipeline(), ExtTextOutW(), FillMonthsComboBox(), FindActionIndex(), ftGdiGetGlyphOutline(), GdipGetStringFormatHotkeyPrefix(), get_bitmap_sample_size(), get_type_size(), GetCBSelectedMonth(), GetGeneralGroupData(), CAppsListView::GetLParam(), GetPageFileSizes(), GetSelectedUsageAction(), GetTextFromListView(), GetUserMembershipData(), HEADER_MouseMove(), HEADER_SetHotDivider(), HEXEDIT_SelectAll(), HEXEDIT_Update(), InitDevUsageActions(), InitGroupMembersList(), InitListAllModesDialog(), InitMainWnd(), InitMetrics(), InitMonitorDialog(), InitProbeListPage(), InitToolbox(), InitUserGroupsList(), IntGdiAngleArc(), IntGdiExtCreatePen(), IntSetAconData(), CMenuToolbarBase::IsTrackedItem(), ITypeLib2_Constructor_MSFT(), journal_convert_superblock_v1(), KeyboardSpeedProc(), LBItemFromPt(), LISTBOX_WindowProc(), ListBoxWndProc_common(), LoadConfig(), LoadPermissionsList(), LocationsEnumProc(), LV_AddItems(), MainWnd_OnContextMenu(), MiniportSend(), MonitorSelWndProc(), MonSelHitTest(), MonSelInitDragging(), MonthCalWndProc(), MSFT_DoFuncs(), MSFT_DoVars(), MSFT_GetTdesc(), MSI_RecordDataSize(), NdrSimpleTypeUnmarshall(), NewDocSelDlgProc(), NOTEPAD_LoadSettingsFromRegistry(), NtGdiExtTextOutW(), NtGdiGetCharABCWidthsW(), NtGdiGetCharWidthW(), NtGdiPolyPolyDraw(), NtUserCallOneParam(), NtUserSetCursorIconData(), OnHScroll(), OnMouseScroll(), OnSelChange(), OnSet(), OnTimer(), OptionsProc(), CDrvDefExt::PaintStaticControls(), ParseDaysOfWeek(), PickIconProc(), Pos_SaveData(), ProbeListPageDlgProc(), ProgressWindowProc(), resample_bitmap_pixel(), resample_bitmap_pixel_premult(), RotatePoint(), RtlIsTextUnicode(), SAFEARRAY_GetVTSize(), SaveSetting(), SaveSettings(), SelectionChanged(), CHttpClient::SendFile(), SetEnvironmentDialogListViewColumns(), SetGroupsListColumns(), SetListViewColumns(), SettingsPageProc(), SetUsersListColumns(), ShowFailureActions(), simple_round(), SpiGetSetProbeBuffer(), StatusWindowProc(), test__lwrite(), test_nextmarker(), test_nextpathtype(), TOOLTIPS_TrackPosition(), UninstallApplication(), CTaskSwitchWnd::UpdateButtonsSize(), UpdateDisplay(), UpdateMonitorSelection(), UpdateRefreshFrequencyList(), UpdateRefreshRateSelection(), UserSetClassLongPtr(), weld_dec3n(), WMSFT_compile_typeinfo_aux(), WritePageFileSettings(), WSHIoctl_GetInterfaceList(), WSPGetSockOpt(), wvnsprintfA(), and wvnsprintfW(). Definition at line 24 of file polytest.cpp. Definition at line 29 of file polytest.cpp. Definition at line 23 of file polytest.cpp. Definition at line 63 of file polytest.cpp. Definition at line 64 of file polytest.cpp. Definition at line 22 of file polytest.cpp. Definition at line 26 of file polytest.cpp. Definition at line 31 of file polytest.cpp. Definition at line 91 of file polytest.cpp. Referenced by IntEngLineTo(), and POLYGONFILL_MakeEdge(). Definition at line 70 of file polytest.cpp. Referenced by bInitDefaultPalette(), bInitSURF(), BmfdGetFontInstance(), BmfdQueryFont(), BmfdQueryFontTree(), BRUSHOBJ_pvAllocRbrush(), DdAllocateObject(), DdGetFreeHandle(), DdHmgCreate(), DrvEnablePDEV(), DrvEnableSurface(), DrvSetPalette(), DrvSetPointerShape(), EngCreateClip(), EngCreateSection(), EngCreateSectionHack(), EngCreateWnd(), EngLoadModuleEx(), EXLATEOBJ_vInitialize(), FtfdLoadFontFile(), FtfdQueryFont(), FtfdQueryFontTree(), GdiPoolAllocateSection(), GdiPoolCreate(), GetAvailableModes(), getAvailableModes(), HackFixup(), InitPointer(), InitSurface(), intDdCreateSurfaceOrBuffer(), intDdEnableDriver(), IntEngUpdateClipRegion(), IntGdiLoadFontsFromMemory(), IntGdiPolyline(), IntInitDefaultPalette(), IntSetPalette(), malloc(), ParseFonFile(), Polygon(), POLYGONFILL_MakeEdge(), POLYGONFILL_MakeEdgeList(), realloc(), RunTest(), VGADDI_AllocSavedScreenBits(), and VGADDI_InitializeOffScreenMem(). Definition at line 325 of file polytest.cpp. Definition at line 673 of file polytest.cpp. Definition at line 107 of file polytest.cpp. 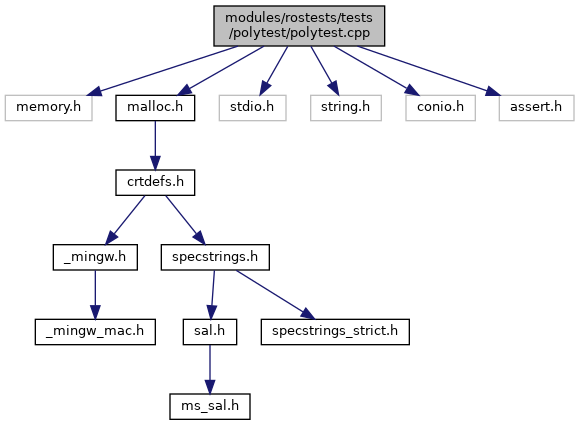 Referenced by IntGdiLineTo(), IntGdiPolygon(), IntRectangle(), Polygon(), POLYGONFILL_FillScanLineAlternate(), and POLYGONFILL_FillScanLineWinding(). Definition at line 816 of file polytest.cpp. 856 // print out our "screen"
Definition at line 85 of file polytest.cpp. Referenced by _Dispatch_type_(), assign_file_addresses(), CcZeroData(), ClassSplitRequest(), GetRemoteDatabaseEntry(), i8042ConnectKeyboardInterrupt(), i8042ConnectMouseInterrupt(), initial_setup(), InitializeTransferPackets(), IntEngLineTo(), InterpretTransferPacketError(), MmExtendCacheSection(), MountMgrCreatePoint(), Polygon(), POLYGONFILL_FillScanLineWinding(), POLYGONFILL_MakeEdge(), POLYGONFILL_UpdateScanline(), prepare_data(), PrepareARPPacket(), rdpdr_add_fds(), sinc_set_converter(), ui_line(), ZSTD_compressBegin_usingCDict_advanced(), ZSTD_compressSequences_internal(), ZSTD_continueCCtx(), ZSTD_decompressStream(), ZSTD_DUBT_findBestMatch(), ZSTD_ldm_adjustParameters(), ZSTD_ldm_generateSequences_internal(), ZSTD_litLengthContribution(), ZSTD_loadZstdDictionary(), ZSTD_resetCCtx_internal(), and ZSTD_sufficientBuff(). Definition at line 79 of file polytest.cpp. Referenced by AfdConnectedSocketWriteData(), alloc_barray(), alloc_sarray(), CcCopyWrite(), CcpMapData(), CcZeroData(), channel_process(), channel_send(), CopyBufferChainToBuffer(), CopyBufferToBufferChain(), DGDeliverData(), DisconnectComplete(), disk_set_information(), do_barray_io(), do_sarray_io(), fast_s_mp_mul_digs(), fast_s_mp_mul_high_digs(), fast_s_mp_sqr(), get_create_time(), HandleReadIrp(), InitializeTransferPackets(), LibTCPGetDataFromConnectionQueue(), md2_process(), mp_gcd(), mp_get_int(), mp_karatsuba_mul(), mp_mul(), per_scan_setup(), Polygon(), POLYGONFILL_FillScanLineWinding(), POLYGONFILL_UpdateScanline(), pre_process_data(), prepare_data(), process_colour_pointer_common(), rdp_enum_bmpcache2(), s_mp_mul_digs(), s_mp_mul_high_digs(), SatisfyPacketRecvRequest(), SendComplete(), ServiceTransferRequest(), sinc_hex_vari_process(), sinc_mono_vari_process(), sinc_multichan_vari_process(), sinc_quad_vari_process(), sinc_stereo_vari_process(), StepLowMemRetry(), StreamSocketConnectComplete(), TryToSatisfyRecvRequestFromBuffer(), ui_create_colourmap(), ui_line(), ZSTD_compressBegin_usingCDict_advanced(), ZSTD_compressBlock_internal(), ZSTD_compressBlock_opt_generic(), ZSTD_continueCCtx(), ZSTD_count_2segments(), ZSTD_decodeSeqHeaders(), ZSTD_decodeSequence(), ZSTD_decodeSequenceLong(), ZSTD_decodingBufferSize_min(), ZSTD_decompressSequencesLong_body(), ZSTD_decompressStream(), ZSTD_DUBT_findBestMatch(), ZSTD_DUBT_findBetterDictMatch(), ZSTD_encodeSequences_body(), ZSTD_estimateCCtxSize_usingCCtxParams(), ZSTD_estimateCStreamSize_usingCCtxParams(), ZSTD_estimateDStreamSize(), ZSTD_getBlockSize(), ZSTD_getFrameHeader_advanced(), ZSTD_insertBt1(), ZSTD_insertBtAndGetAllMatches(), ZSTD_insertDUBT1(), ZSTD_ldm_adjustParameters(), ZSTD_ldm_getTableSize(), ZSTD_ldm_limitTableUpdate(), ZSTD_limitCopy(), ZSTD_loadZstdDictionary(), ZSTD_reset_matchState(), ZSTD_resetCCtx_internal(), ZSTD_sizeof_matchState(), and ZSTD_sufficientBuff(). Definition at line 730 of file polytest.cpp. Referenced by Brush(), CC_PaintTriangle(), draw_cap(), draw_diag_edge(), DrawHands(), DrawPrimitive(), FlatComboProc(), InitColorButtons(), IntDrawDiagEdge(), main(), PlayEnhMetaFileRecord(), PlayMetaFileRecord(), Poly(), PolygonTest(), test_all_functions(), and TRACKBAR_FillThumb(). Definition at line 340 of file polytest.cpp. 352 ** First lets check to see if we have a new smallest value. 361 ** Ok, now scan to the next spot to put this item. Definition at line 503 of file polytest.cpp. Definition at line 230 of file polytest.cpp. Referenced by FillPolygon(), and POLYGONFILL_MakeEdgeList(). Definition at line 527 of file polytest.cpp. Definition at line 574 of file polytest.cpp. 624 // nope - render the old line.. Definition at line 254 of file polytest.cpp. 262 //Now Fill the struct. Definition at line 383 of file polytest.cpp. 406 // if a straight horizontal line - who cares? Definition at line 437 of file polytest.cpp. Definition at line 96 of file polytest.cpp. Definition at line 61 of file polytest.cpp. Referenced by __RxAcquireFcb(), __RxInitializeTopLevelIrpContext(), _At_(), _CcpFlushCache(), _DoDLLInjection(), _Function_class_(), _IRQL_requires_(), _KsEdit(), _main(), _MiFlushMappedSection(), _MiMapViewOfSegment(), _MiSimpleWrite(), _MiWriteBackPage(), _MmSetPageEntrySectionSegment(), _Success_(), _tWinMain(), AccRewriteSetEntriesInAcl(), acpi_bus_add(), acpi_bus_attach(), acpi_bus_check_device(), acpi_bus_driver_init(), acpi_bus_generate_event(), acpi_bus_get_device(), acpi_bus_get_power(), acpi_bus_get_private_data(), acpi_bus_init(), acpi_bus_notify(), acpi_bus_receive_event(), acpi_bus_set_power(), acpi_button_add(), acpi_disable_wakeup_device_power(), acpi_enable_wakeup_device_power(), acpi_exit(), acpi_init(), acpi_power_add(), acpi_power_init(), acpi_system_add(), ACPIDispatchDeviceControl(), ACPIEnumerateDevices(), AcpiOsAllocate(), AcpiOsExecute(), AcpiOsGetRootPointer(), AcpiOsInitialize(), AcpiOsInstallInterruptHandler(), AcpiOsMapMemory(), AcpiOsReadMemory(), AcpiOsReadPciConfiguration(), AcpiOsReadPort(), AcpiOsRemoveInterruptHandler(), AcpiOsSleep(), AcpiOsStall(), AcpiOsTerminate(), AcpiOsUnmapMemory(), AcpiOsWriteMemory(), AcpiOsWritePciConfiguration(), AcpiOsWritePort(), AcquireMutexThread(), AcquireRemoveRestorePrivilege(), add_assembly(), add_dependent_assembly_id(), add_dll_redirect(), add_log_points_new_stroke(), AddConsoleAliasA(), AddConsoleAliasW(), AddDesktopItemW(), AddDevice(), AddDeviceInternal(), AddDeviceToList(), AddDiskToList(), CUSBQueue::AddEndpointDescriptor(), AddEntriesFromInfSection(), CCabinet::AddFile(), AddFixupArray(), AddItemW(), AddNewEventSource(), AddPenLinesBounds(), CCabinet::AddSearchCriteria(), AddSectionToCopyQueue(), AddSectionToCopyQueueCab(), AddToCommandLineHistory(), AdjustHandleCounts(), AllocAndGetEntityArray(), CUSBRequest::AllocateEndpointDescriptor(), AllocateIndexNode(), AllocateRegistryPathInfo(), AllocConsole(), APICCalibrateTimer(), APICSetup(), append_multi_sz_value(), ApphelpCacheInitialize(), ApphelpCacheLookupEntry(), ApphelpCacheParse(), ApphelpCacheUpdateEntry(), ApphelpCacheWrite(), ApplyRegistryValues(), AsciiFromScan(), AsciiToScan(), auxMessage(), BaseCheckAppcompatCache(), BaseComputeProcessExePath(), BaseComputeProcessSearchPath(), BaseCreateStack(), BaseFormatObjectAttributes(), BaseInitializeContext(), BasepAnsiStringToHeapUnicodeString(), BasepCheckWinSaferRestrictions(), BasepGetComputerNameFromNtPath(), BasepLoadLibraryAsDatafile(), BasepMapFile(), BasepNotifyCsrOfThread(), BasepNotifyTrackingService(), BaseProcessInitPostImport(), BaseProcessStartup(), BasePushProcessParameters(), BatteryClassCoInstaller(), BatteryClassInitializeDevice(), BatteryClassInstall(), BatteryClassIoctl(), BatteryClassStatusNotify(), BatteryClassUnload(), BdaCheckChanges(), BdaCommitChanges(), BdaCreateFilterFactoryEx(), BdaCreatePin(), BdaCreateTopology(), BdaDeletePin(), BdaFilterFactoryUpdateCacheData(), BdaGetChangeState(), BdaInitFilter(), BdaMethodCreatePin(), BdaMethodCreateTopology(), BdaMethodDeletePin(), BdaPropertyGetControllingPinId(), BdaPropertyGetPinControl(), BdaPropertyNodeDescriptors(), BdaPropertyNodeEvents(), BdaPropertyNodeMethods(), BdaPropertyNodeProperties(), BdaPropertyNodeTypes(), BdaPropertyPinTypes(), BdaPropertyTemplateConnections(), BdaStartChanges(), BdaUninitFilter(), BdaValidateNodeProperty(), BeginPlayback(), bind(), BindAdapterByName(), Bios32Post(), BiosBootstrapLoader(), BiosHandleMasterPicIRQ(), BiosHandleSlavePicIRQ(), BiosKeyboardIrq(), BlasterCleanup(), BlasterClose(), BlasterCreate(), BlasterDeviceControl(), BlasterUnload(), BlasterWrite(), BootLoaderPage(), BrowseIndexEntries(), BrowseSubNodeIndexEntries(), build_dllredirect_section(), CUSBRequest::BuildBulkInterruptEndpoint(), CUSBRequest::BuildControlTransferQueueHead(), BuildFullDirectoryPath(), CUSBDevice::BuildInterfaceDescriptor(), CUSBRequest::BuildIsochronousEndpoint(), Bus_AddDevice(), Bus_DestroyPdo(), Bus_FDO_PnP(), Bus_FDO_Power(), Bus_InitializePdo(), Bus_PDO_EvalMethod(), Bus_PDO_PnP(), Bus_PDO_Power(), Bus_PDO_QueryDeviceId(), Bus_PDO_QueryDeviceText(), Bus_PDO_QueryInterface(), Bus_PDO_QueryResources(), Bus_PlugInDevice(), Bus_PnP(), Bus_Power(), Bus_StartFdo(), CabinetExtractFile(), CabinetFindFirst(), CabinetFindNext(), CabinetFindNextFileSequential(), CabinetOpen(), Call16(), CallMouseUserHandlers(), CallSessionThread(), CcCopyRead(), CcCopyWrite(), CcFlushCache(), CcGetFileObjectFromBcb(), CcInitializeCacheManager(), CcInitializeCacheMap(), CcInitView(), CcMapData(), CcpAcquireFileLock(), CcpAllocateCacheSections(), CcpAllocateSection(), CcpDereferenceCache(), CcPerformReadAhead(), CcpMapData(), CcpPinMappedData(), CcpReadAhead(), CcpReleaseFileLock(), CcPreparePinWrite(), CcpUnmapCache(), CcpUnpinData(), CcRepinBcb(), CcRosCreateVacb(), CcRosFlushDirtyPages(), CcRosGetVacb(), CcRosInitializeFileCache(), CcRosInternalFreeVacb(), CcRosLookupVacb(), CcRosMarkDirtyFile(), CcRosReleaseVacb(), CcRosRemoveIfClosed(), CcRosTrimCache(), CcRosUnmapVacb(), CcScheduleReadAhead(), CcSetFileSizes(), CcUninitializeCacheMap(), CcUnpinData(), CcUnpinRepinnedBcb(), CcWriteBehind(), CcZeroData(), CDirectSoundCapture_fnCreateCaptureBuffer(), CDirectSoundCapture_fnGetCaps(), CDirectSoundCapture_fnInitialize(), CDirectSoundCapture_fnQueryInterface(), CdromPropPageProvider(), ChangeUserProfileType(), CheckFileSystemPage(), CheckForGuestsAndAdmins(), CheckForLoadedProfile(), CheckForValidPEAndVendor(), CheckUnattendedSetup(), Chkdsk(), ChkdskCallback(), ChkdskPartition(), CInterruptSynchronizedRoutine(), CleanUpPICE(), CleanupSoundBlaster(), ClockPropertyCorrelatedPhysicalTime(), ClockPropertyCorrelatedTime(), ClockPropertyFunctionTable(), ClockPropertyPhysicalTime(), ClockPropertyResolution(), ClockPropertyState(), ClockPropertyTime(), CloseProc(), closesocket(), CloseSoundBlaster(), CloseStreamRoutine(), ClrLineHercules(), CmBattOpenClose(), CmBattUnload(), CmiInitializeHive(), CmLoadKey(), CmpAddSubKey(), CmpAssignSecurityDescriptor(), CmpCreateControlSet(), CmpCreateHardwareProfile(), CmpDeepCopyKeyInternal(), CmpDoFlushNextHive(), CmpEnumerateOpenSubKeys(), CmpFreeSecurityDescriptor(), CmpQuerySecurityDescriptor(), CmpSecurityMethod(), CmpSetSecurityDescriptor(), CmpUnlinkHiveFromMaster(), CmSaveKey(), CmSaveMergedKeys(), CmUnloadKey(), COMMAND_PROTOTYPE(), CCabinet::CommitDataBlocks(), CompareProductName(), CompleteRequest(), CompleteWaveOverlap(), CMSZipCodec::Compress(), CCabinet::ComputeChecksum(), ComputeCompatibleFormat(), ConCfgReadUserSettings(), ConDllInitialize(), ConDrvAttachTerminal(), ConDrvClose(), ConDrvConsoleCtrlEventTimeout(), ConDrvDeleteConsole(), ConDrvDeregisterFrontEnd(), ConDrvDetachTerminal(), ConDrvInitConsole(), ConDrvInitConsoleSupport(), ConDrvInsertConsole(), ConDrvOpen(), ConDrvRegisterFrontEnd(), ConDrvSetConsoleMode(), ConfigureSoundBlasterDevice(), ConioProcessKey(), ConioResizeBuffer(), connect(), ConnectConsole(), ConsoleClientShutdown(), ConsoleControlDispatcher(), ConsoleInitHercules(), ConsoleInitVga(), ConSrvAllocateConsole(), ConSrvCloseHandle(), ConSrvCloseHandleEntry(), ConSrvConnect(), ConSrvConsoleCtrlEventTimeout(), ConSrvDeleteConsole(), ConSrvDisconnect(), ConSrvGetObject(), ConSrvInitConsole(), ConSrvInitConsoleSupport(), ConSrvInitTerminal(), ConSrvLoadFrontEnd(), ConSrvReadUserSettings(), ConSrvRemoveConsole(), ConSrvTermInitTerminal(), ConstructDeviceName(), ConstructSoundDeviceNames(), Control(), ControlSoundBlaster(), CCabinet::ConvertDateAndTime(), ConvertLargeMCBToDataRuns(), ConvertNtPathToWin32Path(), ConvertPackageArguments(), ConvertTokenToKeyword(), ConvertTokenToLineNumber(), ConvertTokenToModuleAndName(), ConvertTokenToSrcFile(), ConvertTokenToSymbol(), ConWndProc(), CopyBlock(), CopyDirectory(), CopyKey(), CopyLines(), CopyUserProfile(), CpuSimulate(), create_journal_dev(), CreateCompatiblePin(), CreateComputerTypeList(), CreateDeviceIds(), CreateDIBitmap(), CreateDirectoryPath(), CreateDisplayDriverList(), CreateDMA(), CreateEnvironmentBlock(), CreateExtendedPartitionPage(), CHCDController::CreateFDO(), CreateFiberEx(), CreateGreenFdo(), CreateGroupListRoutine(), CreateGroupOrderListRoutine(), CreateIndexBufferFromBTreeNode(), CreateLogicalPartitionPage(), CreateMailslotW(), CreateNestedKey(), CreateNewDriveLetterName(), CreateNTOSInstallationsList(), CreatePartitionDeviceObjects(), CHubController::CreatePDO(), CreatePrimaryPartitionPage(), CreateProcessInternalA(), CreateProcessInternalW(), CreateProcessNotifyRoutine(), CreateProfileMutex(), CreateRedirectedFile(), CreateRemoteThread(), CreateSecurityPage(), CreateServiceListEntry(), CreateSession(), CCabinet::CreateSimpleCabinet(), CreateSoundBlaster(), CreateSoundDevice(), CreateSoundDeviceWithDefaultName(), CreateStockObjects(), CreateThreadNotifyRoutine(), CreateUsbChildDeviceObject(), CreateUserHive(), CreateUserProfileA(), CreateUserProfileExA(), CreateUserProfileExW(), CreateUserProfileW(), CriticalDeviceCoInstaller(), CSR_API(), CsrClientCallServer(), CsrClientConnectToServer(), CsrDebugProcess(), CsrDebugProcessStop(), CsrParseServerCommandLine(), CsrpConnectToServer(), DC_bAllocDcAttr(), DC_vCleanup(), DC_vCopyState(), DC_vRestoreDC(), debug(), DebuggerShell(), DecodeRun(), DefaultConsoleCtrlHandler(), DeInstallInt3Hook(), DeInstallPrintkHook(), DeInstallSWBreakpoint(), DeInstallTraceHook(), DeleteDesktopItemW(), DeleteGroupW(), DeleteItemW(), DeleteObject(), DeleteProc(), DeleteProfileA(), DeleteUserProfile(), CCabinet::DestroyDeletedFileNodes(), DestroyEnvironmentBlock(), DestroySoundDevice(), DestroySoundDeviceWithDefaultName(), DestroyUsbChildDeviceObject(), DeviceBayClassInstaller(), DeviceInterfaceChangeCallback(), DeviceInterfaceTest_Func(), DeviceStatusChangeThread(), DfsDriverEntry(), DIB_16BPP_AlphaBlend(), DIB_24BPP_AlphaBlend(), DIB_32BPP_AlphaBlend(), DIB_CreateDIBSection(), DIB_GetBitmapInfo(), DIB_XXBPP_AlphaBlend(), DIB_XXBPP_StretchBlt(), DisableDeviceInstance(), DisableSpeaker(), DiskPropPageProvider(), Dispatch(), Dispatch_fnClose(), DispatchCreateKMix(), DispatchCreateKMixPin(), DispatchCreateSysAudio(), DispatchCreateSysAudioPin(), DisplayClassInstaller(), DisplaySaveSettings(), DisplaySourceFile(), DllGetClassObject(), DllInitialize(), DllMain(), DMusMPUInterruptServiceRoutine(), DMusUARTTimerDPC(), DnsHostnameToComputerNameA(), DnsHostnameToComputerNameW(), DnsRecordCompare(), DnsRecordCopyEx(), DnsRecordListFree(), DnsRecordSetCompare(), DnsRecordSetCopyEx(), DnsRecordSetDetach(), do_reg_operation(), CDFParser::DoCabinetName(), CDFParser::DoCabinetNameTemplate(), DoDataIntersection(), CDFParser::DoDiskLabel(), CDFParser::DoDiskLabelTemplate(), DoesPathExist(), CDFParser::DoInfFileName(), CDFParser::DoMaxDiskSize(), DoQuery(), DosAllocateMemory(), DosBootsectorInitialize(), DosCloseHandle(), DosCreateFile(), DosForceDuplicateHandle(), DosFreeMemory(), DosInitialize(), DosInt21h(), DosLinkUmb(), DosMouseService(), DosOpenFile(), DosOpenHandle(), DosQueryHandle(), DosReadCharacter(), DosReadFile(), DosResizeMemory(), DosSeekFile(), DosStart(), DosTerminateProcess(), DosUnlinkUmb(), DosWriteFile(), DoWriteConsole(), DriverCleanup(), DriverClose(), DriverCreate(), DriverDispatch(), DriverEntry(), DriverIoControl(), DriverProc(), DriverUnload(), DrvAssertMode(), DrvDisablePDEV(), DrvDisableSurface(), DrvEnableDriver(), DrvEnablePDEV(), DrvEnableSurface(), DSoundEnumerate(), DumpAutomationTable(), DumpCBW(), DumpEventSourceList(), DumpFilterDescriptor(), DumpProc(), dwarfopen(), EditSecurity(), EHCI_AbortAsyncTransfer(), EHCI_AbortTransfer(), EHCI_AddDummyQHs(), EHCI_AlignHwStructure(), EHCI_DisableAsyncList(), EHCI_DisableInterrupts(), EHCI_DisablePeriodicList(), EHCI_DumpHwQH(), EHCI_DumpHwTD(), EHCI_EnableInterrupts(), EHCI_EnablePeriodicList(), EHCI_FlushInterrupts(), EHCI_GetEndpointStatus(), EHCI_GetErrorFromTD(), EHCI_GetOffsetEECP(), EHCI_InitializeHardware(), EHCI_InitializeInterruptSchedule(), EHCI_InitializeSchedule(), EHCI_InsertQhInAsyncList(), EHCI_InsertQhInPeriodicList(), EHCI_OpenBulkOrControlEndpoint(), EHCI_OpenEndpoint(), EHCI_OpenInterruptEndpoint(), EHCI_PollHaltedAsyncEndpoint(), EHCI_QueryEndpointRequirements(), EHCI_RemoveQhFromAsyncList(), EHCI_RemoveQhFromPeriodicList(), EHCI_ReopenEndpoint(), EHCI_ResumeController(), EHCI_RH_ChirpRootPort(), EHCI_RH_ClearFeaturePortEnable(), EHCI_RH_ClearFeaturePortEnableChange(), EHCI_RH_ClearFeaturePortPower(), EHCI_RH_ClearFeaturePortResetChange(), EHCI_RH_ClearFeaturePortSuspend(), EHCI_RH_ClearFeaturePortSuspendChange(), EHCI_RH_FinishReset(), EHCI_RH_GetPortStatus(), EHCI_RH_PortResetComplete(), EHCI_RH_PortResumeComplete(), EHCI_RH_SetFeaturePortReset(), EHCI_RH_SetFeaturePortSuspend(), EHCI_SetAsyncEndpointState(), EHCI_SetEndpointDataToggle(), EHCI_SetEndpointState(), EHCI_SetEndpointStatus(), EHCI_StartController(), EHCI_SuspendController(), EHCI_TakeControlHC(), EhciDeferredRoutine(), EISA_ELCR_Read(), EisaUpHalPropPageProvider(), ElfCreateBackupLogHandle(), ElfCreateEventLogHandle(), ElfpInitExistingFile(), ElfrBackupELFW(), ElfrClearELFW(), ElfrIntReportEventW(), ElfrNumberOfRecords(), ElfrOpenBELA(), ElfrOpenBELW(), ElfrRegisterEventSourceW(), ElfrReportEventA(), EnableDeviceInstance(), EnableIrq(), EnableSpeaker(), EngAlphaBlend(), EngDeleteEvent(), EngpCreatePDEV(), EngWaitForSingleObject(), ENTRY_pentPopFreeEntry(), ENTRY_ReferenceEntryByHandle(), ENTRY_vPushFreeEntry(), Enum(), EnumDeviceKeys(), EnumerateAudioFilter(), EnumerateBiosDiskEntries(), EnumerateDevices(), EnumerateInstallations(), EnumerateReactOSEntries(), EnumerateSoundDevices(), EnumerateSubkey(), EnumFontFamiliesA(), EnumFontFamiliesExA(), EnumFontFamiliesExW(), EnumFontFamiliesW(), Evaluate(), EvaluateSymbol(), ExpAddTagForBigPages(), ExpDeleteMutant(), ExpInitializeEventImplementation(), ExpInitializeEventPairImplementation(), ExpInitializeMutantImplementation(), ExpInitializeProfileImplementation(), ExpInitializeSemaphoreImplementation(), ExpSetTimeZoneInformation(), ExpUuidLoadSequenceNumber(), ExpUuidSaveSequenceNumber(), ExpWin32kInit(), ExpWin32SessionCallout(), ext2_print_super(), Ext2Format(), ExtractArray(), CCabinet::ExtractFile(), ExtractNumber(), ExtractStructMembers(), ExtractTypeName(), ExtractTypeNumber(), Fast486ExceptionWithErrorCode(), FAT12FindAndMarkAvailableCluster(), Fat12Format(), Fat12WriteBootSector(), FAT12WriteCluster(), Fat12WriteFAT(), Fat12WriteRootDirectory(), FAT16FindAndMarkAvailableCluster(), Fat16Format(), Fat16WriteBootSector(), FAT16WriteCluster(), Fat16WriteFAT(), Fat16WriteRootDirectory(), FAT32FindAndMarkAvailableCluster(), Fat32Format(), Fat32WriteBootSector(), FAT32WriteCluster(), Fat32WriteFAT(), Fat32WriteFsInfo(), Fat32WriteRootDirectory(), FATAddEntry(), FATDelEntry(), FATGetNextDirEntry(), FatWipeSectors(), Fatx16WriteFAT(), Fatx32WriteFAT(), FATXAddEntry(), FATXDelEntry(), FatxFormat(), FatxWriteBootSector(), FatxWriteRootDirectory(), FdcAddDevice(), FdcClose(), FdcCreate(), FdcDriverUnload(), FdcFdoConfigCallback(), FdcFdoPnp(), FdcFdoQueryBusRelations(), FdcFdoStartDevice(), FdcPdoPnp(), FdcPdoQueryCapabilities(), FdcPdoQueryId(), FdcPnp(), FdcPower(), FDO_HandleInternalDeviceControl(), FDO_HandlePnp(), FDO_HandleResetCyclePort(), FDO_StartDevice(), FdoCleanup(), FdoClose(), FdoCreate(), FdoCreateRawParallelPdo(), FdoEnumerateDevices(), FdoLocateChildDevice(), FdoPnp(), FdoPnpControl(), FdoPower(), FdoPowerControl(), FdoQueryBusRelations(), FdoRead(), FdoStartDevice(), FdoWrite(), FillPolygon(), FillSolid(), FilterInstanceSetup(), FilterPinPropertyHandler(), FilterUnload(), find_actctx_dll(), find_dll_redirection(), find_entry_by_id(), find_entry_by_name(), find_guid(), find_string_index(), FindAddressForSourceLine(), FindAttribute(), FindBootStore(), FindDevices(), FindDriverObjectDirectory(), FindFile(), FindFirstAttribute(), FindFirstFileExW(), FindFunctionByAddress(), FindFunctionInModuleByName(), FindGlobalStabSymbol(), CUSBQueue::FindInterruptEndpointDescriptor(), FindLocalsByAddress(), FindMatchingCreateItem(), FindModuleByName(), FindModuleFromAddress(), FindModuleSymbols(), FindModuleSymbolsByModuleName(), CCabinet::FindNext(), FindNextAttribute(), FindNextVolumeW(), FindNTOSInstallations(), FindSourceLineForAddress(), FindTypeDefinition(), FindTypeDefinitionForCombinedTypes(), FindWinMMDeviceIndex(), FixupUpdateSequenceArray(), FltpAttachToFileSystemDevice(), FONT_mbtowc(), FormatCallback(), FormatEx(), FormatPartition(), FormatPartitionPage(), ForwardIrpAndWait(), FreeDeviceList(), FreeLdrEnumerateBootEntries(), FsdGetFsAttributeInformation(), FsdGetFsDeviceInformation(), FsdGetFsFullSizeInformation(), FsdGetFsSizeInformation(), FsdGetFsVolumeInformation(), FsdRead(), FsdSetFsLabelInformation(), FsdWrite(), FsRecIsCdfsVolume(), FsRecIsUdfsVolume(), FsRtlAcknowledgeOplockBreak(), FsRtlAddBaseMcbEntry(), FsRtlAddLargeMcbEntry(), FsRtlAllocateOplock(), FsRtlCancelExclusiveIrp(), FsRtlCancelOplockIIIrp(), FsRtlCancelWaitIrp(), FsRtlCheckLockForReadAccess(), FsRtlCheckLockForWriteAccess(), FsRtlCheckOplock(), FsRtlCompleteLockIrpReal(), FsRtlCompletionRoutinePriv(), FsRtlCurrentBatchOplock(), FsRtlFastCheckLockForRead(), FsRtlFastCheckLockForWrite(), FsRtlFastUnlockAll(), FsRtlFastUnlockAllByKey(), FsRtlFastUnlockSingle(), FsRtlGetNextBaseMcbEntry(), FsRtlGetNextLargeMcbEntry(), FsRtlInitializeLargeMcb(), FsRtlInitializeOplock(), FsRtlLookupBaseMcbEntry(), FsRtlLookupLargeMcbEntry(), FsRtlLookupLastBaseMcbEntry(), FsRtlLookupLastBaseMcbEntryAndIndex(), FsRtlLookupLastLargeMcbEntry(), FsRtlLookupLastLargeMcbEntryAndIndex(), FsRtlNotifyCompletion(), FsRtlNotifyFilterChangeDirectory(), FsRtlNotifyFilterReportChange(), FsRtlNumberOfRunsInBaseMcb(), FsRtlNumberOfRunsInLargeMcb(), FsRtlOpBatchBreakClosePending(), FsRtlOplockBreakNotify(), FsRtlOplockBreakToII(), FsRtlOplockBreakToNone(), FsRtlOplockCleanup(), FsRtlOplockFsctrl(), FsRtlOplockIsFastIoPossible(), FsRtlPrivateLock(), FsRtlProcessFileLock(), FsRtlRemoveAndCompleteIrp(), FsRtlRemoveAndCompleteWaitIrp(), FsRtlRemoveBaseMcbEntry(), FsRtlRemoveLargeMcbEntry(), FsRtlRequestExclusiveOplock(), FsRtlRequestOplockII(), FsRtlResetBaseMcb(), FsRtlResetLargeMcb(), FsRtlSplitBaseMcb(), FsRtlSplitLargeMcb(), FsRtlTruncateBaseMcb(), FsRtlTruncateLargeMcb(), FsRtlUninitializeBaseMcb(), FsRtlUninitializeLargeMcb(), FsRtlUninitializeOplock(), FsRtlWaitOnIrp(), FstubDbgPrintDriveLayoutEx(), FstubDbgPrintPartitionEx(), FstubDbgPrintSetPartitionEx(), FstubReadHeaderEFI(), FstubVerifyPartitionTableEFI(), FstubWriteHeaderEFI(), ftGdiGetGlyphOutline(), ftGdiGetTextCharsetInfo(), ftGetFontUnicodeRanges(), GDI_Bezier(), GDI_CleanupForProcess(), GdiFlushUserBatch(), GDIOBJ_hInsertObject(), GDIOBJ_LockObject(), GDIOBJ_ReferenceObjectByHandle(), GDIOBJ_TryLockObject(), GDIOBJ_vSetObjectOwner(), GdiPoolAllocate(), GdiPoolFree(), CPortPinWaveCyclic::GeneratePositionEvents(), get_manifest_in_associated_manifest(), get_manifest_in_manifest_file(), get_manifest_in_module(), get_manifest_in_pe_file(), CCabinet::GetAbsoluteOffset(), getaddrinfo(), GetAddrInfoW(), GetBusInterface(), GetCharABCWidthsA(), GetCharABCWidthsFloatA(), GetCharABCWidthsFloatW(), GetCharABCWidthsI(), GetCharABCWidthsW(), GetCharacterPlacementW(), GetCharWidth32A(), GetCharWidth32W(), GetCharWidthA(), GetCharWidthFloatA(), GetCharWidthFloatW(), GetCharWidthI(), GetCharWidthW(), GetComputerIdentifier(), GetConsoleAliasA(), GetConsoleAliasesA(), GetConsoleAliasesW(), GetConsoleAliasExesA(), GetConsoleAliasExesLengthA(), GetConsoleAliasExesLengthW(), GetConsoleAliasExesW(), GetConsoleAliasW(), GetCurrentResources(), GetDefaultSoundDeviceNameBodies(), CMiniportDMusUART::GetDescription(), GetDesktopPath(), GetDeviceCapabilities(), GetDeviceCaps(), GetDeviceCount(), GetDeviceData(), GetDeviceInstanceList(), GetDeviceInstanceListSize(), GetDeviceListInterfaces(), GetDirtyStatus(), GetDiskOrPartition(), GetDisplayIdentifier(), GetEnumeratorInstanceList(), GetEnumeratorInstanceListSize(), GetEventSourceByName(), GetFilterNodeProperty(), GetFilterPinDataRanges(), GetFontPenalty(), GetFontResourceInfoW(), GetFromCommandLineHistory(), GetGlyphOutlineA(), GetGlyphOutlineW(), gethostbyaddr(), gethostbyname(), gethostname(), GetIFEntry(), GetIPSNMPInfo(), GetKerningPairsA(), GetLargestConsoleWindowSize(), GetLinearAddress(), GetLinesInCommandHistory(), GetLogicalPartitionCount(), GetMappedFileNameA(), GetMappedFileNameW(), GetModuleHandleForUnicodeString(), getnameinfo(), GetNameInfoW(), GetNextCluster(), GetNextClusterExtend(), GetNextPartition(), GetNextUncheckedPartition(), GetNextUnformattedPartition(), GetNextUnpartitionedEntry(), GetOutlineTextMetricsA(), GetPackageSize(), GetPartition(), getpeername(), GetPrevPartition(), GetPrevUnpartitionedEntry(), GetPrimaryPartitionCount(), GetProcessorInformation(), GetProfiles(), GetProfileType(), GetProgramsPath(), getprotobyname(), getprotobynumber(), getservbyname(), getservbyport(), GetServiceInstanceList(), GetServiceInstanceListSize(), getsockname(), getsockopt(), GetSoundBlasterModel(), GetSourceFileAndTargetLocation(), GetTdiEntityType(), GetTempFileNameW(), GetTempPathW(), GetTextExtentExPointW(), GetTimeZoneInformation(), GetUserProfileDirectoryW(), GetUserSidStringFromToken(), CUSBHardwareDevice::GlobalReset(), GPNotificationThreadProc(), GreCreateCompatibleDC(), GreenAddDevice(), GreenClose(), GreenCreate(), GreenDeviceIoControl(), GreenDispatch(), GreenPnp(), GreenPower(), GreenQueryBusRelations(), GreGetDIBitsInternal(), GreGetObject(), GreOpenDCW(), GreSetObjectOwnerEx(), GspBreakIn(), GspLoadBreakpoints(), GspLoadHwBreakpoint(), GspLoadSwBreakpoint(), GspRemoveHwBreakpoint(), GspRemoveSwBreakpoint(), GspSetHwBreakpoint(), GspSetSwBreakpoint(), GspUnloadBreakpoints(), GuiChangeIcon(), GuiConsoleGuiThread(), GuiConsoleHandleNcCreate(), GuiConsoleInputThread(), GuiConsoleNotifyWndProc(), GuiConsoleReadUserSettings(), GuiConsoleShowConsoleProperties(), GuiConsoleSwitchFullScreen(), GuiCopyFromGraphicsBuffer(), GuiCopyFromTextModeBuffer(), GuiDeinitFrontEnd(), GuiInit(), GuiInitFrontEnd(), GuiPasteToTextModeBuffer(), GuiSetActiveScreenBuffer(), HalAllProcessorsStarted(), HalBeginSystemInterrupt(), HalDisableSystemInterrupt(), HalEnableSystemInterrupt(), HaliConstructDefaultISAMPTable(), HaliFindSmpConfig(), HaliGetSmpConfig(), HaliInitBSP(), HaliMPBusInfo(), HaliMPIntLocalInfo(), HaliMPIntSrcInfo(), HaliMPIOApicInfo(), HaliMPProcessorInfo(), HalInitializeProcessor(), HaliReadMPConfigTable(), HaliReconfigurePciInterrupts(), HaliScanForMPConfigTable(), HalpAcpiGetTableFromBios(), HalpAddDevice(), HalpAssignDrive(), HalpDispatchPnp(), HalpDispatchPower(), HalpDriverEntry(), HalpFixupPciSupportedRanges(), HalpGetPCIData(), HalpGrowMapBuffers(), HalpInitializeClock(), HalpInitPhase0(), HalpQueryAcpiResourceRequirements(), HalpQueryIdFdo(), HalpQueryIdPdo(), HalpScatterGatherAdapterControl(), HalPutScatterGatherList(), HalpXboxDeviceHasXboxPartitioning(), HalpXboxExamineMBR(), HalpXboxIoReadPartitionTable(), HalpXboxIoSetPartitionInformation(), HalpXboxIoWritePartitionTable(), HalpXboxReadSector(), HalRequestIpi(), HalStartNextProcessor(), CHubController::HandleBulkOrInterruptTransfer(), CHubController::HandleClassDevice(), CHubController::HandleClassInterface(), CHubController::HandleClassOther(), CHubController::HandleDeviceControl(), HandleDoubleFault(), CHubController::HandleGetDescriptor(), HandleGPFault(), HandleInDebuggerFault(), CHubController::HandleIsochronousTransfer(), CPortPinWaveRT::HandleKsProperty(), CPortPinWaveRT::HandleKsStream(), CPortPinWavePci::HandleKsStream(), HandlePageFault(), HandlePhysicalConnection(), CHCDController::HandlePnp(), CHubController::HandlePnp(), HDA_PDOHandleQueryDeviceText(), HdcClassInstaller(), hGetPEBHandle(), Hid_DisableConfiguration(), Hid_DispatchUrb(), Hid_PnpStart(), HidClass_Create(), HidClass_ReadCompleteIrp(), HidClassDispatch(), HidClassPDO_HandleQueryDeviceId(), HidClassPDO_PnP(), HidCreate(), HidInternalDeviceControl(), HidParser_BuildCollectionContext(), HidPnp(), HidUsb_GetReportDescriptor(), HidUsb_ReadReportCompletion(), HidUsb_ResetWorkerRoutine(), HotkeyThread(), HvpInitializeMemoryHive(), HvpWriteHive(), HvpWriteLog(), HvTrackCellRef(), i8042ParseSMBiosTables(), IDirectSound8_fnCreateSoundBuffer(), IDirectSound8_fnInitialize(), IDirectSound8_fnQueryInterface(), IDirectSoundCaptureBufferImpl_GetCurrentPosition(), IDirectSoundCaptureBufferImpl_Lock(), IDirectSoundCaptureBufferImpl_QueryInterface(), IDirectSoundCaptureBufferImpl_Start(), IDirectSoundCaptureBufferImpl_Stop(), IdnToAscii(), IdnToNameprepUnicode(), IdnToUnicode(), IInterruptServiceRoutine(), IKsClock_DispatchDeviceIoControl(), IKsDevice_Create(), IKsDevice_fnArbitrateAdapterChannel(), IKsDevice_fnQueryInterface(), IKsDevice_Pnp(), IKsDevice_PnpPostStart(), IKsDevice_PnpStartDevice(), IKsFilter_CreateDescriptors(), IKsFilter_DispatchCreatePin(), IKsFilter_DispatchDeviceIoControl(), IKsFilter_fnQueryInterface(), IKsFilterFactory_Create(), IKsFilterFactory_fnInitialize(), IKsFilterFactory_fnQueryInterface(), IKsPin_DispatchCreateClock(), IKsPin_DispatchDeviceIoControl(), IKsPin_DispatchKsStream(), IKsPin_fnQueryInterface(), IKsPin_PinAllocatorFramingPropertyHandler(), IKsPin_PinCentricWorker(), IKsPin_PinDataFormatPropertyHandler(), IKsPin_PinMasterClock(), IKsPin_PinStatePropertyHandler(), IKsPin_PrepareStreamHeader(), ImageView_DrawImage(), ImageView_PrintTo(), ImageView_PrintToA(), ImageView_PrintToW(), inet_ntoa(), InfHostOpenFile(), InfHostWriteFile(), InfOpenBufferedFile(), InfOpenFile(), InfpAddField(), InfpAddLine(), InfpAddLineWithKey(), InfpAddSection(), InfpBuildFileBuffer(), InfpFindFirstLine(), InfpFindOrAddSection(), InfpGetBinaryField(), InfpGetData(), InfpGetDataField(), InfpGetIntField(), InfpGetLineCount(), InfpGetMultiSzField(), InfpGetStringField(), InfpGetSubstitutionString(), InfWriteFile(), IniCacheAddKey(), IniCacheAddSection(), IniCacheAppendSection(), IniCacheCreate(), IniCacheFindFirstValue(), IniCacheFindNextValue(), IniCacheGetKey(), IniCacheGetSection(), IniCacheGetSectionName(), IniCacheInsertKey(), IniCacheLoad(), IniCacheLoadByHandle(), IniCacheLoadFromMemory(), IniCacheSave(), IniCacheSaveByHandle(), InitAtomTable(), CCabinet::InitCabinetHeader(), CUSBRequest::InitDescriptor(), InitDestinationPaths(), InitDevice(), initFlood(), CMiniportDMusUART::InitializeHardware(), InitializePnPManager(), InitializePool(), InitializeProfiles(), InitializeSoundBlaster(), CUSBQueue::InitializeSyncSchedule(), InitMPU(), InitPICE(), InitSoundCard(), InsertAudioDevice(), InsertConsole(), InstallBtrfsBootcodeToPartition(), InstallBuiltinAccounts(), InstallDevice(), InstallFatBootcodeToFloppy(), InstallFatBootcodeToPartition(), InstallInt3Hook(), InstallIntEHook(), InstallLiveCD(), InstallPrintkHook(), InstallPrivileges(), InstallReactOS(), InstallScreenSaverA(), InstallScreenSaverW(), InstallSetupInfFile(), InstallSWBreakpoint(), InstallSysSetupInfComponents(), InstallTraceHook(), InstallVirtualSWBreakpoint(), InstallWizard(), InstantiatePins(), Int32Call(), Int_EnumDependentServicesW(), IntArc(), IntCreateDICW(), IntCreatePrimarySurface(), IntCreateRegistryPath(), IntelStackWalk(), IntEngGradientFillTriangle(), InterfaceBusGetBusData(), InterfaceBusGetDmaAdapter(), InterfaceBusSetBusData(), InterfaceBusTranslateBusAddress(), InterfaceDereference(), InterfacePciDevicePresent(), InterfacePciDevicePresentEx(), InterfaceReference(), InternalDirectSoundCaptureCreate(), InternalDirectSoundCreate(), InternalGetAtomName(), InternalReadNonResidentAttributes(), InterruptServiceRoutine(), IntExtTextOutW(), IntFillConsoleOutputCode(), IntGdiAddFontResource(), IntGdiArcInternal(), IntGdiCleanDC(), IntGdiCleanupPrivateFontsForProcess(), IntGdiCombineRgn(), IntGdiExtCreatePen(), IntGdiGetFontResourceInfo(), IntGdiLineTo(), IntGdiLoadFontsFromMemory(), IntGdiSetHookFlags(), IntGetAliasEntry(), IntGetConsoleInput(), IntGetFullFileName(), IntGhostWindowFromHungWindow(), IntHideMousePointer(), IntHungWindowFromGhostWindow(), IntLoadFontSubstList(), IntMakeHungWindowGhosted(), IntReadConsole(), IntReadConsoleOutput(), IntReadConsoleOutputCode(), IntRequestFontSize(), IntTranslateKey(), IntUpdateControlKeyState(), IntVKFromKbdInput(), IntWideCharToMultiByteCP(), IntWriteConsole(), IntWriteConsoleInput(), IntWriteConsoleOutput(), IntWriteConsoleOutputCode(), IoAcquireRemoveLockEx(), IOAPICClearPin(), IOAPICSetupIds(), IOAPICSetupIrqs(), IoCompletion(), IoGetDeviceInterfaces(), IoGetDeviceProperty(), IoGetDmaAdapter(), IoInitializeRemoveLockEx(), IoInvalidateDeviceState(), IoOpenDeviceRegistryKey(), IopActionConfigureChildServices(), IopActionInitChildServices(), IopActionInterrogateDeviceStack(), IopAttachFilterDriversCallback(), IopBootLog(), IopCancelPrepareDeviceForRemoval(), IopCreateArcNamesCd(), IopCreateArcNamesDisk(), IopCreateDeviceInstancePath(), IopCreateDeviceKeyPath(), IopCreateDeviceNode(), IopCreateDriver(), IopCreateLogFile(), IopDeviceStatus(), IopEnumerateDetectedDevices(), IopEnumerateDevice(), IopFilterResourceRequirements(), IopFindPortResource(), IopFixupResourceListWithRequirements(), IopGetDeviceDepth(), IopGetDeviceProperty(), IopGetDeviceRelations(), IopGetDriverObject(), IopGetRelatedDevice(), IopInitializeBootDrivers(), IopInitializeDevice(), IopInitializeDriverModule(), IopInitializePnpServices(), IopInitLookasideLists(), IopInstallCriticalDevice(), IopIsFirmwareMapperDisabled(), IopLoadServiceModule(), IopLoadUnloadDriver(), IopNormalizeImagePath(), IopNotifyPlugPlayNotification(), IopOpenInterfaceKey(), IopPrepareDeviceForRemoval(), IopQueryAttributesFile(), IopQueryCompatibleIds(), IopQueryHardwareIds(), IopRemoveDevice(), IopResetDevice(), IopSaveBootLogToFile(), IopSetDeviceInstanceData(), IopSetServiceEnumData(), IopStartDevice2(), IopStopDevice(), IopStoreSystemPartitionInformation(), IopTraverseDeviceTree(), IopUnloadDevice(), IopUnloadDriver(), IopUpdateRootKey(), IopWriteLogFile(), IOReadB(), IoReadPartitionTableEx(), IoRegisterDeviceInterface(), IoRegisterPlugPlayNotification(), IoReleaseRemoveLockAndWaitEx(), IoReleaseRemoveLockEx(), IoReportDetectedDevice(), IoRequestDeviceEject(), IoSetDeviceInterfaceState(), IoUnregisterPlugPlayNotification(), IoWMIRegistrationControl(), IOWriteB(), IoWritePartitionTableEx(), IRQPolarity(), IRQTrigger(), IsaAddDevice(), IsAcpiComputer(), IsaCreateClose(), IsaFdoPnp(), IsaIoctl(), IsaPnp(), IsaReadWrite(), IsBitSet(), IsCallInstrAtEIP(), IsConsoleBoot(), IsModuleLoaded(), IsPermanentSWBreakpoint(), CUSBQueue::IsQueueHeadComplete(), IsRetAtEIP(), IsSpeakerEnabled(), IsValidNTOSInstallationByHandle(), KbdHid_Close(), KbdHid_Create(), KbdHid_InsertScanCodes(), KbdHid_InternalDeviceControl(), KbdHid_Pnp(), KbdHid_ReadCompletion(), KbdHid_StartDevice(), KdbInitialize(), KdbpCliInit(), KdbpCliInterpretInitFile(), KdbpSymAddCachedFile(), KdbpSymFindCachedFile(), KdbpSymLoadModuleSymbols(), KdbSymPrintAddress(), KdbSymProcessSymbols(), KdpGdbEnterDebuggerException(), KeCancelTimer(), KeConnectInterrupt(), KeDumpIrqList(), KeInitializeTimerEx(), KeInsertByKeyDeviceQueue(), KeInsertDeviceQueue(), KeRemoveByKeyDeviceQueue(), KeRemoveByKeyDeviceQueueIfBusy(), KeRemoveDeviceQueue(), KeRemoveEntryDeviceQueue(), KeSetBaseGdtSelector(), KeSetGdtSelector(), KeSetTimerEx(), KeWaitForMultipleObjects(), KeyboardAddDevice(), KeyboardClassInstaller(), KeyboardDeviceWorker(), KeyboardEventHandler(), KeyboardGetKeyPolled(), KeyboardInternalDeviceControl(), KfLowerIrql(), KfRaiseIrql(), Ki386CreateIdentityMap(), Ki386FreeIdentityMap(), KiAmdK6InitializeMTRR(), KiCompleteTimer(), KiDispatchException(), KiInitializeContextThread(), KiInitializeMTRR(), KiInitializePAT(), KiInitMachineDependent(), KiInsertTimerTable(), KiInsertTreeTimer(), KiInterruptDispatch2(), KiPageFaultHandler(), KiRestoreFastSyscallReturnState(), KiSetupDecrementerTrap(), KiSignalTimer(), KiSystemCallHandler(), KiTrap0DHandler(), KiVdmOpcodeIRET(), KMix_AddDevice(), KMix_Pnp(), KmtUserCallbackThread(), KoCreateInstance(), KsAcquireDevice(), KsAddIrpToCancelableQueue(), KsAddItemToObjectBag(), KsAddObjectCreateItemToDeviceHeader(), KsAddObjectCreateItemToObjectHeader(), KsAllocateObjectHeader(), KsCreateBusEnumObject(), KsCreateDevice(), KsDereferenceSoftwareBusObject(), KsDispatchIrp(), KsDispatchQuerySecurity(), KsFilterAddTopologyConnections(), KsFilterCreatePinFactory(), KsFilterFactoryUpdateCacheData(), KsFreeObjectHeader(), KsGetBusEnumIdentifier(), KsGetBusEnumParentFDOFromChildPDO(), KsGetBusEnumPnpDeviceObject(), KsGetDevice(), KsGetFilterFromIrp(), KsGetPinFromIrp(), KsInitializeDevice(), KsInitializeDriver(), KsInstallBusEnumInterface(), KsIsBusEnumChildDevice(), KspCompletePendingIrps(), KspCountEventSets(), KspCountMethodSets(), KspCountPropertySets(), KspCreate(), KspCreateDeviceAssociation(), KspCreateFilter(), KspCreateFilterFactory(), KspCreatePin(), KspEnableBusDeviceInterface(), KspEnableEvent(), KspHandleDataIntersection(), KsPinAttemptProcessing(), KsPinGetFirstCloneStreamPointer(), KsPinGetLeadingEdgeStreamPointer(), KsPinGetReferenceClockInterface(), KspPinPropertyHandler(), KspReadMediaCategory(), KspRegisterDeviceAssociation(), KsProbeStreamIrp(), KSPropertySetImpl_fnQueryInterface(), KSPropertySetImpl_Get(), KspSetDeviceInterfacesState(), KspValidateConnectRequest(), KsReleaseDeviceSecurityLock(), KsRemoveBusEnumInterface(), KsRemoveIrpFromCancelableQueue(), KsRemoveSpecificIrpFromCancelableQueue(), KsServiceBusEnumCreateRequest(), KsServiceBusEnumPnpRequest(), KsSetMajorFunctionHandler(), KsStreamPointerAdvanceOffsets(), KsStreamPointerClone(), KsStreamPointerDelete(), KsStreamPointerGetNextClone(), KsTopologyPropertyHandler(), LdrDisableThreadCalloutsForDll(), LdrFindEntryForAddress(), LdrFindResource_U(), LdrFindResourceDirectory_U(), LdrGetDllHandleEx(), LdrLockLoaderLock(), LdrpAllocateDataTableEntry(), LdrpCheckForLoadedDll(), LdrpInit(), LdrpInitializeProcess(), LdrpInitializeThread(), LdrpLoadImportModule(), LdrpRunInitializeRoutines(), LdrpSnapIAT(), LdrpSnapThunk(), LdrpWalkImportDescriptor(), LdrQueryProcessModuleInformationEx(), LdrShutdownProcess(), LdrShutdownThread(), LdrUnlockLoaderLock(), LdrVerifyImageMatchesChecksum(), LegacyAttachInterrupt(), LineInputKeyDown(), ListDriverModules(), listen(), ListSWBreakpoints(), ListSymbolStartingAt(), ListUserModules(), CDFParser::Load(), LoadEventSources(), LoadExports(), LoadImageNotifyRoutine(), LoadLogFile(), LoadLogFiles(), loadmemsection(), LoadSettings(), LoadSetupInf(), LoadShellLinkConsoleInfo(), LoadSymbols(), LoadSymbolsFromConfig(), LoadUserProfileA(), LoadUserProfileW(), CCabinet::LocateFile(), LockAllocate(), LockCompare(), LockCompleteCanceledIrp(), LockFree(), LockOrUnlockVolume(), LockPeekNextIrp(), LogfBackupFile(), LogfCreate(), lookup_assembly(), LookupSidInformation(), LsaDeregisterLogonProcess(), LsaRegisterLogonProcess(), MainWindowProc(), McbMappingAllocate(), McbMappingFree(), MemExceptionHandler(), MI_WS_OWNER(), MiAllocatePoolPages(), MiAllocateSharedMemory(), MiCheckForUserStackOverflow(), MiCowCacheSectionPage(), MiDecrementShareCount(), MiDeletePte(), MiDispatchFault(), midMessage(), MiDoPoolCopy(), MiFindInitializationCode(), MiFreeSegmentPage(), MiGetPageProtection(), MiInitChip(), MiInitializeSectionPageTable(), MiInitializeSystemPtes(), MiInitMachineDependent(), MiInsertPageInList(), MiInsertStandbyListAtFront(), MiMapLockedPagesInUserSpace(), MiMapPfnDatabase(), MiMapViewOfDataSection(), MiniportCloseEndpoint(), MiniportHalt(), MiniportHandleInterrupt(), MiniportInitialize(), MiniportISR(), MiniportOpenEndpoint(), MiniportQueryInformation(), MiniportReset(), MiniportSend(), MiniportSetInformation(), MiniportShutdown(), MiPrepareInitializationBlock(), MiProtectVirtualMemory(), MiQueryCard(), MiQueryMemoryBasicInformation(), MiQueryMemorySectionName(), MiReadFilePage(), MiReadPage(), MiReadPageFile(), MiReloadBootLoadedDrivers(), MiRemoveMappedPtes(), MiResolveDemandZeroFault(), MiResolveImageReferences(), MiResolveTransitionFault(), MiRosUnmapViewInSystemSpace(), MiRosUnmapViewOfSection(), MiScanMemoryDescriptors(), MiSectionPageTableGet(), MiSectionPageTableGetOrAllocate(), MiSegmentDelete(), MiSimpleRead(), MiSnapThunk(), MiSyncMediaDetection(), MiTrimMemoryConsumer(), MiUnmapLockedPagesInUserSpace(), MiUpdateThunks(), MixerThreadRoutine(), MmAccessFault(), MmAccessFaultCacheSection(), MmAccessFaultSectionView(), MmAllocateSpecialPool(), MmAllocPage(), MmArmAccessFault(), MmArmInitSystem(), MmCallDllInitialize(), MmCanFileBeTruncated(), MmCopyMmInfo(), MmCreateCacheSection(), MmCreateMemoryArea(), MmCreatePeb(), MmCreateProcessAddressSpace(), MmCreateVirtualMappingInternal(), MmCreateVirtualMappingUnsafe(), MmDeleteProcessAddressSpace(), MmDeleteTeb(), MmDeleteVirtualMapping(), MmDereferencePage(), MmExtendCacheSection(), MmFinalizeSectionPageOut(), MmFinalizeSegment(), MmFlushImageSection(), MmFreeCacheSectionPage(), MmFreeLoaderBlock(), MmFreeMemoryArea(), MmFreePagesFromMdl(), MmFreePageTable(), MmFreePageTablesSectionSegment(), MmFreeSpecialPool(), MmGetFileNameForAddress(), MmGetPageTableForProcessForPAE(), MmGetReferenceCountPage(), MmInitGlobalKernelPageDirectory(), MmInitSectionImplementation(), MMixerAddMixerControl(), MMixerAddMixerControlsToMixerLineByNodeIndexArray(), MMixerAddMixerSourceLines(), MMixerCheckFormat(), MMixerCountMixerControls(), MMixerFindAudioDataRange(), MMixerGetLineControls(), MMixerGetLineInfo(), MMixerGetPhysicalConnection(), MMixerGetSourceMixerLineByLineId(), MMixerHandleAlternativeMixers(), MMixerHandlePhysicalConnection(), MMixerInitializeFilter(), MMixerPrintMixerLineControls(), MMixerPrintTopology(), MMixerSetControlDetails(), MMixerSetGetControlDetails(), MMixerSetGetMuxControlDetails(), MmMapCacheViewInSystemSpaceAtOffset(), MmMapViewInSystemSpace(), MmMapViewOfSection(), MmNotPresentFault(), MmNotPresentFaultCachePage(), MmNotPresentFaultCacheSection(), MmNotPresentFaultCacheSectionInner(), MmNotPresentFaultSectionView(), MmpAccessFault(), MmPageOutSectionView(), MmpCloseSection(), MmpDeleteSection(), MmpPageOutPhysicalAddress(), MmProbeAndLockPages(), MmpSectionAccessFaultInner(), MmReferencePage(), MmSetPageProtect(), MmTrimUserMemory(), MmUnlockPages(), MmUnmapCacheViewInSystemSpace(), MmUnmapViewOfCacheSegment(), MmWithdrawSectionPage(), MmWritePageSectionView(), MmWriteToSwapPage(), MmZeroPageThread(), modMessage(), MonitorThread(), MouHid_Close(), MouHid_Create(), MouHid_InternalDeviceControl(), MouHid_Pnp(), MouHid_ReadCompletion(), MouHid_StartDevice(), MouseClassInstaller(), MouseDlgProc(), MoveDeviceInstance(), MoveFileWithProgressW(), MpsSpuriousHandler(), MPU401Cleanup(), MPU401Close(), MPU401Create(), MPU401DeviceControl(), MPU401Unload(), MsfsClose(), MsfsCreate(), MsfsCreateMailslot(), MsfsQueryInformation(), MsfsRead(), MsfsSetInformation(), MsfsWrite(), MSZipAlloc(), MSZipCodecUncompress(), MSZipFree(), MupDereferenceMasterQueryContext(), NduCloseAdapterComplete(), NduDispatchClose(), NduDispatchCreate(), NduNetPnPEvent(), NduOpenAdapterComplete(), NduReceive(), NduRequestComplete(), NduResetComplete(), NduSendComplete(), NduTransferDataComplete(), NduUnload(), NeedToReInstallSWBreakpoints(), CCabinet::NewCabinet(), NewDirectSound(), NewDirectSoundCapture(), NewDirectSoundCaptureBuffer(), NewDispatchObject(), CCabinet::NewFolder(), NewKsPropertySet(), NewMiniportDMusUART(), NewPortDMus(), NewPortTopology(), NewPortWaveCyclic(), NewPortWavePci(), NewPortWaveRT(), note(), NotifyTopLevelWindow(), NtAccessCheck(), NtAdjustPrivilegesToken(), NtAllocateVirtualMemory(), NtApmClassInstaller(), NtApphelpCacheControl(), NtCreateEvent(), NtCreateEventPair(), NtCreateKey(), NtCreateMutant(), NtCreatePagingFile(), NtCreateSemaphore(), NtDeleteKey(), NtEnumerateKey(), NtEnumerateValueKey(), NtFreeVirtualMemory(), NtfsCleanup(), NtfsCleanupFile(), NtfsClose(), NtfsCloseFile(), NtfsCreate(), NtfsDeviceIoControl(), NtfsDoRequest(), NtfsFileSystemControl(), NtfsFindFileAt(), NtfsFindMftRecord(), NtfsGetBothDirectoryInformation(), NtfsGetDirectoryInformation(), NtfsGetFCBForFile(), NtfsGetFsAttributeInformation(), NtfsGetFsDeviceInformation(), NtfsGetFsSizeInformation(), NtfsGetFsVolumeInformation(), NtfsGetFullDirectoryInformation(), NtfsGetNamesInformation(), NtfsGetPositionInformation(), NtfsGetVolumeData(), NtfsGrabFCB(), NtfsGrabFCBFromTable(), NtfsLookupFileAt(), NtfsMakeAbsoluteFilename(), NtfsOpenFile(), NtfsQueryDirectory(), NtfsQueryVolumeInformation(), NtfsQueueRequest(), NtfsRead(), NtfsReadDisk(), NtfsReadFile(), NtfsReleaseFCB(), NtfsSetEndOfFile(), NtfsSetVolumeInformation(), NtfsUserFsRequest(), NtfsWrite(), NtfsWriteDisk(), NtfsWriteFile(), NtGdiAddFontMemResourceEx(), NtGdiAddFontResourceW(), NtGdiBeginPath(), NtGdiCloseFigure(), NtGdiCreateCompatibleBitmap(), NtGdiCreateRectRgn(), NtGdiEllipse(), NtGdiEndPath(), NtGdiExtCreateRegion(), NtGdiFlattenPath(), NtGdiGetBoundsRect(), NtGdiGetCharABCWidthsW(), NtGdiGetPath(), NtGdiGetStockObject(), NtGdiIntersectClipRect(), NtGdiOffsetRgn(), NtGdiPathToRegion(), NtGdiRestoreDC(), NtGdiRoundRect(), NtGdiSaveDC(), NtGdiSetDIBitsToDeviceInternal(), NtGdiStrokeAndFillPath(), NtGdiStrokePath(), NtGdiWidenPath(), NtGetPlugPlayEvent(), NtLoadDriver(), NtMapViewOfSection(), NtOpenEvent(), NtOpenKey(), NtOpenMutant(), NtPlugPlayControl(), NtPowerInformation(), NtPulseEvent(), NtQueryEvent(), NtQueryInformationToken(), NtQueryKey(), NtQueryMutant(), NtQueryOpenSubKeys(), NtQuerySemaphore(), NtQueryValueKey(), NtQueryVirtualMemory(), NtReleaseMutant(), NtReleaseSemaphore(), NtResetEvent(), NtSaveKeyEx(), NtSaveMergedKeys(), NtSetEvent(), NtSetHighEventPair(), NtSetHighWaitLowEventPair(), NtSetInformationFile(), NtSetInformationToken(), NtSetLowWaitHighEventPair(), NtSetSystemPowerState(), NtSetValueKey(), NtShutdownSystem(), NtVerQueryValue(), NtWaitHighEventPair(), NtWaitLowEventPair(), nulldrv_AbortPath(), nulldrv_BeginPath(), nulldrv_CloseFigure(), nulldrv_EndPath(), nulldrv_FillPath(), nulldrv_FlattenPath(), nulldrv_SelectClipPath(), nulldrv_StrokeAndFillPath(), nulldrv_StrokePath(), nulldrv_WidenPath(), ObDereferenceDeviceMap(), ObfDereferenceDeviceMap(), ObInheritDeviceMap(), ObpChargeQuotaForObject(), ObpCreateDeviceMap(), ObpDeallocateObject(), ObReferenceObjectByHandle(), ObtClose(), ObtCreateObjectTypes(), OffsetRgn(), OHCI_AbortTransfer(), OHCI_DumpHcdED(), OHCI_DumpHcdTD(), OHCI_InterruptService(), OHCI_PollAsyncEndpoint(), OHCI_ReadRhDescriptorA(), OHCI_ResetController(), OHCI_ResumeController(), OHCI_RH_ClearFeaturePortConnectChange(), OHCI_RH_ClearFeaturePortEnable(), OHCI_RH_ClearFeaturePortEnableChange(), OHCI_RH_ClearFeaturePortOvercurrentChange(), OHCI_RH_ClearFeaturePortPower(), OHCI_RH_ClearFeaturePortResetChange(), OHCI_RH_ClearFeaturePortSuspend(), OHCI_RH_ClearFeaturePortSuspendChange(), OHCI_RH_DisableIrq(), OHCI_RH_EnableIrq(), OHCI_RH_GetHubStatus(), OHCI_RH_GetPortStatus(), OHCI_RH_GetRootHubData(), OHCI_RH_GetStatus(), OHCI_RH_SetFeaturePortEnable(), OHCI_RH_SetFeaturePortPower(), OHCI_RH_SetFeaturePortReset(), OHCI_RH_SetFeaturePortSuspend(), OHCI_StopController(), OHCI_SuspendController(), OHCI_TakeControlHC(), OhciDeferredRoutine(), OkayToCloseProc(), OnActivate(), CDFParser::OnCabinetName(), CDFParser::OnDiskLabel(), OnFocus(), OnInitHardProfDialog(), OnNcCreate(), OnPaletteChanged(), CCabinet::Open(), OpenAndMapFile(), OpenDevice(), OpenDeviceReadWrite(), OpenFilter(), OpenKernelDevice(), OpenMidiDevice(), OpenProc(), OpenSubkey(), OslIsPciDevicePresent(), other_module_cleanup_module(), Output(), Parallel_putchar(), CDFParser::Parse(), Parse(), parse_assembly_elem(), parse_assembly_identity_elem(), parse_description_elem(), parse_file_elem(), parse_manifest(), ParseProc(), ParseShellInfo(), PatchKeyboardDriver(), PATH_AddEntry(), PATH_CreatePath(), PATH_Delete(), PATH_FillPathEx(), PATH_FlattenPath(), PATH_LineTo(), PATH_MoveTo(), PATH_PolyDraw(), PATH_PolyPolyline(), PATH_RestorePath(), PATH_SavePath(), PATH_StrokePath(), PATH_WidenPath(), pathdrv_AbortPath(), pathdrv_AngleArc(), pathdrv_Arc(), pathdrv_ArcTo(), pathdrv_BeginPath(), pathdrv_Chord(), pathdrv_CloseFigure(), pathdrv_CreateDC(), pathdrv_DeleteDC(), pathdrv_Ellipse(), pathdrv_EndPath(), pathdrv_ExtTextOut(), pathdrv_LineTo(), pathdrv_MoveTo(), pathdrv_Pie(), pathdrv_PolyBezier(), pathdrv_PolyBezierTo(), pathdrv_PolyDraw(), pathdrv_Polygon(), pathdrv_Polyline(), pathdrv_PolylineTo(), pathdrv_PolyPolygon(), pathdrv_PolyPolyline(), pathdrv_Rectangle(), pathdrv_RoundRect(), PcAddAdapterDevice(), PcCreateItemDispatch(), PcCreatePinDispatch(), PcDispatchIrp(), PciAddDevice(), PciBridgeIsSubtractiveDecode(), PciDispatchDeviceControl(), PciIdeChannelEnabled(), PciIdeUseDma(), PciIdeXAddDevice(), PciIdeXFdoPnpDispatch(), PciIdeXFdoQueryBusRelations(), PciIdeXFdoStartDevice(), PciIdeXGetBusData(), PciIdeXInitialize(), PciIdeXPdoPnpDispatch(), PciIdeXPdoQueryDeviceText(), PciIdeXPdoQueryId(), PciIdeXPdoQueryResourceRequirements(), PciIdeXSetBusData(), PciIdeXUdmaModesSupported(), PcInitializeAdapterDriver(), PciPnpControl(), PcmciaAddDevice(), PcmciaCreateClose(), PcmciaDeviceControl(), PcmciaPlugPlay(), PcmciaPower(), PcmciaUnload(), PcNewDmaChannel(), PcNewInterruptSync(), PcNewMiniport(), PcNewPort(), PcNewRegistryKey(), PcNewServiceGroup(), PcRegisterAdapterPowerManagement(), PcRegisterIoTimeout(), PcRegisterPhysicalConnection(), PcRegisterSubdevice(), PcUnregisterAdapterPowerManagement(), PDEVOBJ_bEnablePDEV(), PDEVOBJ_pSurface(), PDO_HandleInternalDeviceControl(), PDO_HandlePnp(), PdoCleanup(), PdoClose(), PdoCreate(), PdoExt(), PdoGetRangeLength(), PdoPnp(), PdoPnpControl(), PdoPower(), PdoPowerControl(), PdoQueryBusInformation(), PdoQueryCapabilities(), PdoQueryDeviceRelations(), PdoQueryDeviceText(), PdoQueryId(), PdoQueryResourceRequirements(), PdoQueryResources(), PdoRead(), PdoReadConfig(), PdoStartDevice(), PdoWrite(), pefindrva(), CDFParser::PerformFileCopy(), CDFParser::PerformNewCommand(), PerformSampleRateConversion(), CDFParser::PerformSetCommand(), pesection(), Phase1InitializationDiscard(), pice_close(), PICE_close(), PICE_KdpPrintString(), PICE_len(), PICE_MultiByteToWideChar(), pice_open(), PICE_open(), PICE_strchr(), PiceKbdIsr(), PiceSendIoctl(), Pin2Irq(), Pin_fnDeviceIoControl(), Pin_fnFastWrite(), PinPropertyHandler(), PinWaveCyclicAudioPosition(), PinWaveCyclicDataFormat(), PinWaveCyclicState(), PinWavePciAudioPosition(), PinWavePciDataFormat(), PinWavePciState(), PipCallDriverAddDevice(), PitChan0Out(), PitChan2Out(), PNP_AddID(), PNP_CreateDevInst(), PNP_DeleteClassKey(), PNP_DetectResourceConflict(), PNP_DeviceInstanceAction(), PNP_EnumerateSubKeys(), PNP_GetClassName(), PNP_GetClassRegProp(), PNP_GetCustomDevProp(), PNP_GetDepth(), PNP_GetDeviceList(), PNP_GetDeviceListSize(), PNP_GetDeviceRegProp(), PNP_GetDeviceStatus(), PNP_GetHwProfInfo(), PNP_GetInterfaceDeviceList(), PNP_GetInterfaceDeviceListSize(), PNP_GetRelatedDeviceInstance(), PNP_GetRootDeviceInstance(), PNP_HwProfFlags(), PNP_InitDetection(), PNP_ReportLogOn(), PNP_SetClassRegProp(), PNP_SetDeviceRegProp(), PNP_ValidateDeviceInstance(), PnpEventThread(), PnpRootAddDevice(), PnpRootCreateDevice(), PnpRootDriverEntry(), PnpRootFdoPnpControl(), PnpRootPdoPnpControl(), PnpRootQueryDeviceRelations(), POLYGONFILL_FillScanLineAlternate(), POLYGONFILL_FillScanLineWinding(), POLYGONFILL_MakeEdge(), POLYGONFILL_UpdateScanline(), PopAddRemoveSysCapsCallback(), PopFlushVolumes(), PopFlushVolumeWorker(), PopGracefulShutdown(), PopQuerySystemPowerStateTraverse(), PopSetSystemPowerState(), PopSetSystemPowerStateTraverse(), PopShutdownSystem(), Port61hWrite(), PortClsCreate(), PortClsPnp(), PortClsPower(), PortClsShutdown(), PortClsSysControl(), PrepareCopyInfFile(), PrepareFileCopy(), PrimaryDirectSoundBuffer8Impl_fnGetCaps(), PrimaryDirectSoundBuffer8Impl_fnGetCurrentPosition(), PrimaryDirectSoundBuffer8Impl_fnGetFormat(), PrimaryDirectSoundBuffer8Impl_fnGetFrequency(), PrimaryDirectSoundBuffer8Impl_fnGetPan(), PrimaryDirectSoundBuffer8Impl_fnGetStatus(), PrimaryDirectSoundBuffer8Impl_fnGetVolume(), PrimaryDirectSoundBuffer8Impl_fnPlay(), PrimaryDirectSoundBuffer8Impl_fnQueryInterface(), PrimaryDirectSoundBuffer8Impl_fnSetFormat(), PrimaryDirectSoundBuffer8Impl_fnStop(), PrimaryDirectSoundBuffer_GetPosition(), PrimaryDirectSoundBuffer_SetFormat(), Print(), PrintkCallback(), PrintRingBuffer(), PrintRingBufferHome(), PrintRingBufferOffset(), PrivMoveFileIdentityW(), CUSBQueue::ProcessAsyncList(), ProcessBootParams(), ProcessComputerFiles(), ProcessDisplayRegistry(), ProcessLocaleRegistry(), ProcessorAddDevice(), ProcessorPnp(), ProcessorPower(), ProcessorSetFriendlyName(), ProcessorStartDevice(), ProcessorUnload(), CUSBQueue::ProcessPeriodicSchedule(), ProcessPortMessage(), CMiniportDMusUART::ProcessResources(), ProcessSessionThreadRequest(), ProcessUnattendSection(), PropertyHandler_Synth(), PropertyItemDispatch(), PS2MousePropPageProvider(), PsaCaptureProcessesAndThreads(), PsaCaptureSystemModules(), PsaEnumerateProcessModules(), PspAssignProcessToJob(), PspTerminateJobObject(), PulseSample(), QSI_DEF(), QueryActCtxW(), QueryAdapterOid(), QueryBinding(), CDmaChannelInit::QueryInterface(), CPortWaveRTStreamInit::QueryInterface(), CPortPinWaveRT::QueryInterface(), CDrmPort2::QueryInterface(), CRegistryKey::QueryInterface(), CPortPinWaveCyclic::QueryInterface(), CPortDMus::QueryInterface(), CPortTopology::QueryInterface(), CPortWaveRT::QueryInterface(), CPortWavePci::QueryInterface(), CInterruptSync::QueryInterface(), CMiniportDMusUART::QueryInterface(), CMiniportDMusUARTStream::QueryInterface(), QueryInterface(), QueryNameProc(), QueryPathCompletionRoutine(), QueryStatusChangeEndpoint(), CHubController::QueryStatusChangeEndpoint(), CUSBQueue::QueueHeadCleanup(), QueueWaveBuffer(), RawCheckForDismount(), RawCleanup(), RawClose(), RawCompletionRoutine(), RawCreate(), RawDispatch(), RawFileSystemControl(), RawInitializeVcb(), RawMountVolume(), RawQueryFsAttributeInfo(), RawQueryFsDeviceInfo(), RawQueryFsSizeInfo(), RawQueryFsVolumeInfo(), RawQueryInformation(), RawQueryVolumeInformation(), RawReadWriteDeviceControl(), RawSetInformation(), RawUserFsCtrl(), RChangeServiceConfig2A(), RChangeServiceConfig2W(), RChangeServiceConfigW(), RCloseServiceHandle(), RControlService(), RCreateServiceW(), RDeleteService(), ReadChars(), ReadCharsThread(), CCabinet::ReadDataBlocks(), ReadFileRecord(), ReadFileScatter(), CCabinet::ReadFileTable(), ReadInputBufferThread(), ReadPhysMem(), ReadRegistryEntries(), CCabinet::ReadString(), RealIsr(), RecursiveRemoveDir(), recv(), recvfrom(), RegInitializeRegistry(), REGION_Complexity(), RegistrationNotificationProc(), RegistrationProc(), registry_callback(), RegpCreateOrOpenKey(), RegSetValueExW(), ReInstallSWBreakpoint(), RemoveAllSWBreakpoints(), RemoveDirectoryPath(), RemoveFontResourceExW(), RemoveSWBreakpoint(), REnumDependentServicesA(), REnumDependentServicesW(), REnumServiceGroupW(), REnumServicesStatusA(), REnumServicesStatusExA(), REnumServicesStatusExW(), ReportGreenPdo(), ResetSoundBlaster(), ResolveTarget(), RestoreIdt(), ReturnCompletedBuffers(), RevirtualizeBreakpointsForModule(), RGetServiceDisplayNameA(), RGetServiceDisplayNameW(), RGetServiceKeyNameA(), RGetServiceKeyNameW(), RI_ScGetCurrentGroupStateW(), RI_ScSetServiceBitsW(), RLockServiceDatabase(), RootHubInitCallbackFunction(), ROpenSCManagerA(), ROpenSCManagerW(), ROpenServiceA(), ROpenServiceW(), RosSymCreateFromFile(), RosSymCreateFromMem(), RosSymGetAddressInformation(), RpcServerThread(), RpcThreadRoutine(), RQueryServiceConfig2A(), RQueryServiceConfig2W(), RQueryServiceConfigA(), RQueryServiceConfigW(), RQueryServiceLockStatusA(), RQueryServiceLockStatusW(), RQueryServiceObjectSecurity(), RQueryServiceStatus(), RQueryServiceStatusEx(), RSetServiceObjectSecurity(), RSetServiceStatus(), RStartServiceA(), RStartServiceW(), RtlAcquirePrivilege(), RtlActivateActivationContextEx(), RtlActivateActivationContextUnsafeFast(), RtlAddAtomToAtomTable(), RtlAddRange(), RtlAdjustPrivilege(), RtlAnsiCharToUnicodeChar(), RtlComputeCrc32(), RtlCreateActivationContext(), RtlCreateAtomTable(), RtlCreateHeap(), RtlCreateProcessParameters(), RtlCreateQueryDebugBuffer(), RtlCreateUserProcess(), RtlDeactivateActivationContext(), RtlDeactivateActivationContextUnsafeFast(), RtlDecompressFragment(), RtlDeleteAtomFromAtomTable(), RtlDeleteCriticalSection(), RtlDestroyAtomTable(), RtlDetermineDosPathNameType_U(), RtlDosApplyFileIsolationRedirection_Ustr(), RtlDosSearchPath_Ustr(), RtlEmptyAtomTable(), RtlExpandEnvironmentStrings_U(), RtlFindActivationContextSectionString(), RtlFindCharInUnicodeString(), RtlFindMessage(), RtlFindRange(), RtlFindUnicodePrefix(), RtlFreeRangeList(), RtlGetCurrentDirectory_U(), RtlGetFullPathName_Ustr(), RtlGetFullPathName_UstrEx(), RtlGetSetBootStatusData(), RtlInitCodePageTable(), RtlInitializeContext(), RtlInitializeCriticalSectionAndSpinCount(), RtlInitializeUnicodePrefix(), RtlInitNlsTables(), RtlInsertUnicodePrefix(), RtlIsValidIndexHandle(), RtlLookupAtomInAtomTable(), RtlNextUnicodePrefix(), RtlpAllocateDebugInfo(), RtlpCheckIntegerAtom(), RtlpCreateUnCommittedRange(), RtlpDeCommitFreeBlock(), RtlpDeleteAvlTreeNode(), RtlpDestroyHeapSegment(), RtlpDosPathNameToRelativeNtPathName_Ustr(), RtlpDowncaseUnicodeChar(), RtlpDphAllocateVm(), RtlpDphCoalesceFreeIntoAvailable(), RtlpDphCoalesceNodeIntoAvailable(), RtlpDphFreeVm(), RtlpDphPlaceOnBusyList(), RtlpDphPlaceOnFreeList(), RtlpDphPlaceOnPoolList(), RtlpDphPlaceOnVirtualList(), RtlpDphRemoveFromAvailableList(), RtlpDphRemoveFromBusyList(), RtlpDphRemoveFromFreeList(), RtlpDphReturnNodeToUnusedList(), RtlpDphTakeNodeFromUnusedList(), RtlpExecuteIoWorkItem(), RtlpExecuteWorkItem(), RtlpExtendHeap(), RtlpFindAndCommitPages(), RtlpFreeDebugInfo(), RtlPinAtomInAtomTable(), RtlpInitEnvironment(), RtlpInitializeHeapSegment(), RtlpInsertFreeBlock(), RtlpInsertUnCommittedPages(), RtlpPageHeapAllocate(), RtlpPageHeapReAllocate(), RtlpQueryRemoteProcessModules(), RtlpSetSecurityObject(), RtlpSkipUNCPrefix(), RtlpUnWaitCriticalSection(), RtlpWaitForCriticalSection(), RtlQueryAtomInAtomTable(), RtlQueryEnvironmentVariable_U(), RtlQueryInformationActivationContext(), RtlQueryProcessDebugInformation(), RtlQueryTimeZoneInformation(), RtlQueueWorkItem(), RtlReleasePrivilege(), RtlRemoveUnicodePrefix(), RtlResetRtlTranslations(), RtlSetCurrentDirectory_U(), RtlSetCurrentEnvironment(), RtlSetEnvironmentVariable(), RtlSetIoCompletionCallback(), RtlSetTimeZoneInformation(), RtlWalkFrameChain(), RunCallback16(), RunInstallReactOS(), RUnlockServiceDatabase(), RxAddToTopLevelIrpAllocatedContextsList(), RxAddVirtualNetRootToNetRoot(), RxAllocateCanonicalNameBuffer(), RxAllocateFcbObject(), RxChangeBufferingState(), RxCloseAssociatedSrvOpen(), RxCollapseOrCreateSrvOpen(), RxCommonCleanup(), RxCommonClose(), RxCommonCreate(), RxCommonDevFCBCleanup(), RxCommonDevFCBClose(), RxCommonDevFCBIoCtl(), RxCommonDirectoryControl(), RxCommonQueryInformation(), RxCommonQueryVolumeInformation(), RxCommonRead(), RxCommonSetInformation(), RxCommonWrite(), RxCompleteRequest(), RxCompleteRequest_Real(), RxConstructNetRoot(), RxConstructSrvCall(), RxConstructVirtualNetRoot(), RxCopyCreateParameters(), RxCreateFromNetRoot(), RxCreateNetFcb(), RxCreateNetFobx(), RxCreateNetRoot(), RxCreateRxContext(), RxCreateSrvCall(), RxCreateSrvCallCallBack(), RxCreateSrvOpen(), RxCreateVNetRoot(), RxDispatchToWorkerThread(), RxDriverEntry(), RxFastIoRead(), RxFastIoWrite(), RxFinalizeConnection(), RxFinalizeNetFcb(), RxFinalizeNetFobx(), RxFinalizeNetRoot(), RxFinalizeSrvCall(), RxFinalizeSrvOpen(), RxFinalizeVNetRoot(), RxFindOrConstructVirtualNetRoot(), RxFindOrCreateConnections(), RxFindOrCreateFcb(), RxFinishFcbInitialization(), RxFinishSrvCallConstruction(), RxFinishSrvCallConstructionDispatcher(), RxFirstCanonicalize(), RxFlushFcbInSystemCache(), RxFreeFcbObject(), RxFsdCommonDispatch(), RxFsdDispatch(), RxFsdPostRequest(), RxFspDispatch(), RxGetRegistryParameters(), RxInitializeContext(), RxInitializeVNetRootParameters(), RxLowIoCompletionTail(), RxLowIoIoCtlShellCompletion(), RxLowIoNotifyChangeDirectoryCompletion(), RxLowIoPopulateFsctlInfo(), RxLowIoReadShell(), RxLowIoReadShellCompletion(), RxLowIoSubmit(), RxLowIoWriteShell(), RxLowIoWriteShellCompletion(), RxpAcquirePrefixTableLockExclusive(), RxpAcquirePrefixTableLockShared(), RxpDiscardChangeBufferingStateRequests(), RxpDispatchChangeBufferingStateRequests(), RxpMarkInstanceForScavengedFinalization(), RxpPrepareCreateContextForReuse(), RxPrefixTableInsertName(), RxpReleasePrefixTableLock(), RxpUndoScavengerFinalizationMarking(), RxPurgeFcbInSystemCache(), RxPurgeFobx(), RxPurgeFobxFromCache(), RxPurgeRelatedFobxs(), RxpWorkerThreadDispatcher(), RxQueryBasicInfo(), RxQueryDirectory(), RxQueryNameInfo(), RxQueryStandardInfo(), RxRegisterMinirdr(), RxRemoveNameNetFcb(), RxSearchForCollapsibleOpen(), RxSetRenameInfo(), RxSpinUpRequestsDispatcher(), RxSpinUpWorkerThread(), RxTableLookupName(), RxTableLookupName_ExactLengthMatch(), RxUnwindTopLevelIrp(), RxUpdateCondition(), RxWorkItemDispatcher(), RxXXXControlFileCallthru(), SaveDefaultUserHive(), SbReadData(), SbWriteData(), ScanExports(), ScanExportsByAddress(), ScanForUnpartitionedDiskSpace(), ScmAssignNewTag(), ScmAutoShutdownServices(), ScmAutoStartServices(), ScmCanonDriverImagePath(), ScmCheckDriver(), ScmControlDriver(), ScmControlService(), ScmConvertToBootPathName(), ScmCopyControlSet(), ScmCopyTree(), ScmCreateDefaultSD(), ScmCreateDefaultServiceSD(), ScmCreateLastKnownGoodControlSet(), ScmCreateManagerHandle(), ScmCreateNewControlPipe(), ScmCreateNewServiceRecord(), ScmCreateOrReferenceServiceImage(), ScmCreateServiceDatabase(), ScmDeleteServiceRecord(), ScmGetBootAndSystemDriverState(), ScmGetControlSetValues(), ScmGetDriverStatus(), ScmGetServiceEntryByDisplayName(), ScmGetServiceEntryByName(), ScmGetServiceEntryByResumeCount(), ScmGetServiceGroupByName(), ScmGetServiceImageByImagePath(), ScmGetSetupInProgress(), ScmLoadDriver(), ScmLoadService(), ScmLogonService(), ScmMarkServiceForDelete(), ScmReadDependencies(), ScmReadSecurityDescriptor(), ScmSendStartCommand(), ScmSetFailureActions(), ScmSetServiceGroup(), ScmShutdownServiceDatabase(), ScmStartDriver(), ScmStartRpcServer(), ScmStartService(), ScmStartUserModeService(), ScmUnloadDriver(), ScmWaitForLsa(), ScmWaitForServiceConnect(), ScmWriteSecurityDescriptor(), ScrAcquireOwnership(), ScreenAddDevice(), ScreenDeviceControl(), ScreenWrite(), ScsiClassInstaller(), ScsiPortCompleteRequest(), ScsiPortConvertPhysicalAddressToUlong(), ScsiPortCreateClose(), ScsiPortDeviceControl(), ScsiPortDispatchScsi(), ScsiPortDpcForIsr(), ScsiPortFlushDma(), ScsiPortGetBusData(), ScsiPortGetLogicalUnit(), ScsiPortGetPhysicalAddress(), ScsiPortGetUncachedExtension(), ScsiPortGetVirtualAddress(), ScsiPortInitialize(), ScsiPortIoTimer(), ScsiPortIsr(), ScsiPortLogError(), ScsiPortNotification(), ScsiPortSetBusDataByOffset(), ScsiPortStartIo(), ScsiPortStartPacket(), ScsiPortValidateRange(), SecondaryDirectSoundBuffer8Impl_fnLock(), SecondaryDirectSoundBuffer8Impl_fnPlay(), SecondaryDirectSoundBuffer8Impl_fnQueryInterface(), SecondaryDirectSoundBuffer8Impl_fnSetCurrentPosition(), SecondaryDirectSoundBuffer8Impl_fnStop(), select(), CUSBDevice::SelectConfiguration(), SelectDisk(), SelectFileSystemPage(), SelectPartition(), send(), SendClientShutdown(), SendMenuEvent(), SendRequest(), sendto(), SepAccessCheck(), SepAdjustPrivileges(), SepAdtPrivilegedServiceAuditAlarm(), SepDeleteToken(), SepInitializeTokenImplementation(), SepPrivilegeCheck(), SepRmCommandServerThreadInit(), SepRmCreateLogonSession(), SepRmDeleteLogonSession(), SepRmDereferenceLogonSession(), SepRmReferenceLogonSession(), SeQueryInformationToken(), ServiceControlHandler(), ServiceInit(), ServiceMain(), ServiceSoundBlasterInterrupt(), SeSetWorldSecurityDescriptor(), SetAccountsDomainSid(), SetAdapterOid(), SetAdministratorPassword(), SetAttributesOnFile(), CCabinet::SetCabinetReservedFile(), SetDeviceData(), SetDIBitsToDevice(), SetDirtyStatus(), SetDiskSignature(), SetGlobalInt(), SetHardwareBreakPoint(), SetHardwareBreakPoints(), SetMixerInputOutputFormat(), SetMountedDeviceValues(), SetNonResidentAttributeDataLength(), SetOutputSampleRate(), SetPrimaryDomain(), SetProfileData(), setsockopt(), SetTimeZoneInformation(), SetupCommitFileQueueW(), SetupCreateDirectory(), SetupDeviceInstance(), SetupExtractFile(), SetupIsActive(), SetupQueueCopyWithCab(), SetupStartPage(), SetUserEnvironmentVariable(), SetWaveFormat(), SfcIsFileProtected(), SfcIsKeyProtected(), SharedFace_Create(), SharedFace_Release(), SharedMem_Create(), SharedMem_Release(), shutdown(), SmCompleteSession(), SmConnectApiPort(), SmExecuteProgram(), SmLookupSubsystem(), SmpConfigureAllowProtectedRenames(), SmpConfigureEnvironment(), SmpConfigureExcludeKnownDlls(), SmpConfigureFileRenames(), SmpConfigureKnownDlls(), SmpConfigureObjectDirectories(), SmpConfigureProtectionMode(), SmpConfigureSubSystems(), SmpCreateDynamicEnvironmentVariables(), SmpCreatePagingFile(), SmpCreatePagingFileDescriptor(), SmpCreatePagingFileOnFixedDrive(), SmpCreatePagingFiles(), SmpCreateVolumeDescriptors(), SmpDeletePagingFile(), SmpGetPagingFileSize(), SmpGetVolumeFreeSpace(), SmpInitializeDosDevices(), SmpInitializeKnownDllsInternal(), SmpLoadDataFromRegistry(), SmpProcessFileRenames(), SmpSbCreateSession(), SmpValidatePagingFileSizes(), SmQueryInformation(), SndMixerEnumProducts(), SndMixerQueryConnections(), SndMixerQueryControls(), SndMixerQueryDestinations(), socket(), SoundProgramDMA(), SpeakerChange(), SpiAllocateLunExtension(), SpiBuildDeviceMap(), SpiCleanupAfterInit(), SpiCompletionRoutine(), SpiCreatePortConfig(), SpiGetInquiryData(), SpiGetLunExtension(), SpiGetPciConfigData(), SpiInitOpenKeys(), SpiMiniportTimerDpc(), SpiParseDeviceInfo(), SpiProcessCompletedRequest(), SpiProcessTimeout(), SpiScanAdapter(), SpiSendInquiry(), SpiSendRequestSense(), START_TEST(), StartCaptureIsocTransfer(), StartComponentRegistration(), StartDevice(), StartSessionThread(), StartSoundOutput(), StatusChangeEndpointCompletion(), StorPortGetSrb(), StretchDIBits(), SubmitRequestToRootHub(), SwAddDevice(), SwDispatchCreate(), SwDispatchDeviceControl(), SwDispatchPnp(), Symbol(), SynchronizedDMusMPUWrite(), SysAudio_AddDevice(), SysAudio_Shutdown(), SysAudio_Unload(), SysAudioHandleProperty(), SysAudioOpenKMixer(), SysAudioRegisterDeviceInterfaces(), SysAudioRegisterNotifications(), TakeIdtSnapshot(), TapeClassInstaller(), TapePropPageProvider(), test_checklinkpath(), TestDirectoryControl(), TestDispatch(), TestEntry(), TestFilterUnload(), TestIrpHandler(), TestMessageHandler(), TestObjectType(), TestQueryInformation(), TestSetInformation(), TestShellLink(), TestTimerApcRoutine(), TestUnload(), TextIntRealizeFont(), TextIntUpdateSize(), ThirdPartyVDDBop(), CPortPinDMus::TransferMidiData(), CPortPinDMus::TransferMidiDataToDMus(), TranslateCharsetInfo(), TranslateCOLORREF(), CCFDATAStorage::Truncate(), TryIsolate(), TryMPU(), TryToInstallVirtualSWBreakpoints(), UhciAbortNonIsoTransfer(), UhciAbortTransfer(), UhciBulkOrInterruptTransfer(), UhciControlTransfer(), UhciDeferredRoutine(), UhciDisableInterrupts(), UhciDumpHcdQH(), UhciDumpHcdTD(), UhciEnableInterrupts(), UhciInitializeHardware(), UhciInitializeSchedule(), UhciInsertQH(), UhciOpenEndpoint(), UhciPollNonIsoEndpoint(), UhciQueryEndpointRequirements(), UhciQueueTransfer(), UhciRHClearFeaturePortConnectChange(), UhciRHClearFeaturePortEnable(), UhciRHClearFeaturePortEnableChange(), UhciRHClearFeaturePortOvercurrentChange(), UhciRHClearFeaturePortPower(), UhciRHClearFeaturePortResetChange(), UhciRHClearFeaturePortSuspend(), UhciRHClearFeaturePortSuspendChange(), UhciRHGetRootHubData(), UhciRHGetStatus(), UhciRHPortEnable(), UhciRHPortResetComplete(), UhciRHSetFeaturePortEnable(), UhciRHSetFeaturePortPower(), UhciRHSetFeaturePortReset(), UhciRHSetFeaturePortResetWorker(), UhciRHSetFeaturePortSuspend(), UhciSetEndpointState(), UhciSetEndpointStatus(), UhciStartController(), UhciStopController(), UhciTakeControlHC(), UhciUnlinkQH(), UnassembleOneLineDown(), UnassembleOneLineUp(), UnassembleOnePageDown(), UnassembleOnePageUp(), UnbindAdapterByContext(), CMSZipCodec::Uncompress(), UnhandledExceptionFilter(), UnloadExports(), UnloadSoundBlaster(), UnloadSymbols(), UnloadUserProfile(), CPortPinWaveCyclic::UpdateCommonBuffer(), CPortPinWaveCyclic::UpdateCommonBufferOverlap(), UpdateDiskLayout(), UpdateDiskSignatures(), UpdateFileNameRecord(), UpdateFileRecord(), UpdateIndexEntryFileNameSize(), UpdateIndexNode(), UpdateRegistry(), UpdateUsersShellFolderSettings(), UrbCompletion(), USB2_AllocateCheck(), USB2_AllocateHS(), USB2_AllocateTimeForEndpoint(), USB2_ChangePeriod(), USB2_CheckTtEndpointInsert(), USB2_CommonFrames(), USB2_ConvertFrame(), USB2_DeallocateEndpointBudget(), USB2_DeallocateHS(), USB2_GetStartTime(), USB2_InitController(), USB2_InitTT(), USB2_MoveTtEndpoint(), USB2_PromotePeriods(), USB2_Rebalance(), USB2_RebalanceEndpoint(), USBAudioCreateFilterContext(), USBAudioFilterCreate(), USBAudioPinBuildDescriptors(), USBCCGP_BuildConfigurationDescriptor(), USBCCGP_CustomEnumWithInterface(), USBCCGP_EnumWithAudioLegacy(), USBCCGP_PdoAppendInterfaceNumber(), USBCCGP_PdoHandleDeviceRelations(), USBCCGP_PdoHandleQueryId(), USBCCGP_Unload(), USBD_CreateDeviceEx(), USBD_GetDeviceInformationEx(), USBD_Initialize20Hub(), USBD_InitializeDeviceEx(), USBD_ParseConfigurationDescriptorEx(), USBD_ParseDescriptors(), USBD_RegisterRootHubCallBack(), USBD_RemoveDeviceEx(), USBD_RestoreDeviceEx(), USBD_UnRegisterRootHubCallBack(), USBDI_GetUSBDIVersion(), USBDI_IsDeviceHighSpeed(), USBDI_QueryBusInformation(), USBH_AbortInterruptPipe(), USBH_AddDevice(), USBH_AllocateWorkItem(), USBH_CheckDeviceIDUnique(), USBH_CheckDeviceLanguage(), USBH_CheckHubIdle(), USBH_CheckIdleAbort(), USBH_CheckIdleDeferred(), USBH_CheckIdleWorker(), USBH_CompletePortIdleIrpsWorker(), USBH_CompletePowerIrp(), USBH_CreateDevice(), USBH_DeviceControl(), USBH_DriverUnload(), USBH_EnableParentPort(), USBH_FdoCleanup(), USBH_FdoDeferPoRequestCompletion(), USBH_FdoDispatch(), USBH_FdoIdleNotificationCallback(), USBH_FdoIdleNotificationRequestComplete(), USBH_FdoPoRequestD0Completion(), USBH_FdoRemoveDevice(), USBH_FdoStartDevice(), USBH_FdoSubmitIdleRequestIrp(), USBH_FdoSubmitWaitWakeIrp(), USBH_FdoSurpriseRemoveDevice(), USBH_FdoSyncSubmitUrb(), USBH_FdoWaitWakeIrpCompletion(), USBH_FdoWWIrpIoCompletion(), USBH_FlushPortPwrList(), USBH_FreeWorkItem(), USBH_GetConfigurationDescriptor(), USBH_GetConfigValue(), USBH_GetDeviceDescriptor(), USBH_GetDeviceType(), USBH_GetPortStatus(), USBH_GetRootHubExtension(), USBH_GetSerialNumberString(), USBH_HubCancelIdleIrp(), USBH_HubCancelWakeIrp(), USBH_HubCompletePortIdleIrps(), USBH_HubCompletePortWakeIrps(), USBH_HubCompleteQueuedPortIdleIrps(), USBH_HubCompleteQueuedPortWakeIrps(), USBH_HubDispatch(), USBH_HubESDRecoverySetD3Completion(), USBH_HubIsBusPowered(), USBH_HubPnPIrpComplete(), USBH_HubQueuePortIdleIrps(), USBH_HubQueuePortWakeIrps(), USBH_HubSetD0(), USBH_HubSetDWakeCompletion(), USBH_IdleCancelPowerHubWorker(), USBH_IdleCompletePowerHubWorker(), USBH_IoctlGetDescriptor(), USBH_IoctlGetHubCapabilities(), USBH_IoctlGetNodeConnectionAttributes(), USBH_IoctlGetNodeConnectionDriverKeyName(), USBH_IoctlGetNodeConnectionInformation(), USBH_IoctlGetNodeInformation(), USBH_IoctlGetNodeName(), USBH_IrpCompletion(), USBH_OpenConfiguration(), USBH_PdoDispatch(), USBH_PdoInternalControl(), USBH_PdoIoctlGetPortStatus(), USBH_PdoIoctlResetPort(), USBH_PdoQueryDeviceText(), USBH_PdoQueryId(), USBH_PdoRemoveDevice(), USBH_PdoSetCapabilities(), USBH_PdoStartDevice(), USBH_PortIdleNotificationCancelRoutine(), USBH_PortIdleNotificationRequest(), USBH_PowerIrpCompletion(), USBH_ProcessDeviceInformation(), USBH_QueryCapabilities(), USBH_QueryCapsComplete(), USBH_QueueWorkItem(), USBH_RegQueryGenericUSBDeviceString(), USBH_ResetDevice(), USBH_ResetHub(), USBH_ResetInterruptPipe(), USBH_ResetPortWorker(), USBH_RestoreDevice(), USBH_SelectConfigOrInterfaceComplete(), USBH_SetPdoRegistryParameter(), USBH_StartHubFdoDevice(), USBH_SymbolicLink(), USBH_SyncClearPortStatus(), USBH_SyncDisablePort(), USBH_SyncGetDeviceConfigurationDescriptor(), USBH_SyncGetDeviceHandle(), USBH_SyncGetHubCount(), USBH_SyncGetHubDescriptor(), USBH_SyncGetPortStatus(), USBH_SyncGetRootHubPdo(), USBH_SyncGetStatus(), USBH_SyncGetStringDescriptor(), USBH_SyncIrpComplete(), USBH_SyncPowerOnPort(), USBH_SyncPowerOnPorts(), USBH_SyncResetPort(), USBH_SyncSubmitUrb(), USBH_Transact(), USBH_UrbTimeoutDPC(), USBH_ValidateSerialNumberString(), USBH_Wait(), USBH_Worker(), USBH_WriteFailReasonID(), USBHI_ControllerSelectiveSuspend(), USBHI_CreateUsbDevice(), USBHI_FlushTransfers(), USBHI_GetControllerInformation(), USBHI_GetExtendedHubInformation(), USBHI_GetRootHubSymbolicName(), USBHI_GetUsbDescriptors(), USBHI_Initialize20Hub(), USBHI_InitializeUsbDevice(), USBHI_QueryDeviceInformation(), USBHI_RemoveUsbDevice(), USBHI_RestoreUsbDevice(), USBHI_RootHubInitNotification(), USBHUB_AddDevice(), USBHUB_Cleanup(), USBHUB_Close(), USBHUB_Create(), USBHUB_DispatchDeviceControl(), USBHUB_DispatchInternalDeviceControl(), USBHUB_DispatchPnp(), USBHUB_DispatchPower(), USBHUB_DispatchSystemControl(), USBHUB_DumpingConfiguration(), USBHUB_DumpingDeviceDescriptor(), USBHUB_DumpingIDs(), USBHUB_FdoHandlePnp(), USBHUB_FdoStartDevice(), USBHUB_FlushAllTransfers(), USBHUB_GetBusInterface(), USBHUB_GetBusInterfaceUSBDI(), USBHUB_GetExtendedHubInfo(), USBHUB_ParentFDOStartDevice(), USBHUB_PdoHandleInternalDeviceControl(), USBHUB_PdoHandlePnp(), USBHUB_PdoQueryDeviceText(), USBHUB_PdoQueryId(), USBHUB_PdoStartDevice(), USBHUB_RootHubCallBack(), USBHUB_SetDeviceHandleData(), USBI_InterfaceDereference(), USBI_InterfaceReference(), USBLIB_AddDevice(), USBPORT_AbortTransfers(), USBPORT_AddDevice(), USBPORT_AddDeviceHandle(), USBPORT_AddPipeHandle(), USBPORT_AddUSB1Fdo(), USBPORT_AddUSB2Fdo(), USBPORT_AdjustDeviceCapabilities(), USBPORT_AllocateBandwidth(), USBPORT_AllocateBandwidthUSB2(), USBPORT_AllocateCommonBuffer(), USBPORT_AllocateUsbAddress(), USBPORT_AssertFailure(), USBPORT_AsyncTimerDpc(), USBPORT_CalculateUsbBandwidth(), USBPORT_CancelPendingWakeIrp(), USBPORT_CancelSplitTransfer(), USBPORT_CloseConfiguration(), USBPORT_CompletePdoWaitWake(), USBPORT_CompletePendingIdleIrp(), USBPORT_CompleteTransfer(), USBPORT_CreateDevice(), USBPORT_CreateLegacySymbolicLink(), USBPORT_CreatePdo(), USBPORT_CreateWorkerThread(), USBPORT_DbgPrint(), USBPORT_DeviceHasTransfers(), USBPORT_Dispatch(), USBPORT_DoIdleNotificationCallback(), USBPORT_DoneSplitTransfer(), USBPORT_DoRootHubCallback(), USBPORT_DoSetPowerD0(), USBPORT_DumpingCapabilities(), USBPORT_DumpingIDs(), USBPORT_DumpingSetupPacket(), USBPORT_FdoDeviceControl(), USBPORT_FdoPnP(), USBPORT_FdoPower(), USBPORT_FindCompanionControllers(), USBPORT_FindMiniPort(), USBPORT_FindUSB2Controller(), USBPORT_FlushCancelList(), USBPORT_FreeBandwidth(), USBPORT_FreeBandwidthUSB2(), USBPORT_FreeCommonBuffer(), USBPORT_FreeUsbAddress(), USBPORT_GetConfigValue(), USBPORT_GetDefaultBIOSx(), USBPORT_GetDeviceHwIds(), USBPORT_GetEndpointState(), USBPORT_GetInterfaceHandle(), USBPORT_GetInterfaceLength(), USBPORT_GetMiniportRegistryKeyValue(), USBPORT_GetRegistryKeyValueFullInfo(), USBPORT_GetSetConfigSpaceData(), USBPORT_GetSymbolicName(), USBPORT_GetTt(), USBPORT_GetUnicodeName(), USBPORT_GetUsbDescriptor(), USBPORT_HandleSelectConfiguration(), USBPORT_HandleSelectInterface(), USBPORT_HcQueueWakeDpc(), USBPORT_HcWakeDpc(), USBPORT_IdleNotification(), USBPORT_Initialize20Hub(), USBPORT_InitializeDevice(), USBPORT_InitializeTT(), USBPORT_InitInterfaceInfo(), USBPORT_InvalidateController(), USBPORT_InvalidateRootHub(), USBPORT_IsCompanionController(), USBPORT_IsCompanionFdoExtension(), USBPORT_IsSelectiveSuspendEnabled(), USBPORT_MakeSplitTransfer(), USBPORT_NormalizeHsInterval(), USBPORT_NtStatusToMpStatus(), USBPORT_NukeAllEndpoints(), USBPORT_OpenInterface(), USBPORT_ParseConfigurationDescriptor(), USBPORT_ParseResources(), USBPORT_PdoInternalDeviceControl(), USBPORT_PdoPnP(), USBPORT_PdoPower(), USBPORT_PdoQueryInterface(), USBPORT_QueryCapabilities(), USBPORT_QueryPciBusInterface(), USBPORT_ReadWriteConfigSpace(), USBPORT_RegisterDeviceInterface(), USBPORT_RegisterUSBPortDriver(), USBPORT_RemoveDevice(), USBPORT_RemoveDeviceHandle(), USBPORT_RemovePipeHandle(), USBPORT_RemoveUSBxFdo(), USBPORT_RequestAsyncCallback(), USBPORT_RestoreDevice(), USBPORT_RH_SetFeatureUSB2PortPower(), USBPORT_RootHubClassCommand(), USBPORT_RootHubCreateDevice(), USBPORT_RootHubEndpoint0(), USBPORT_RootHubPowerAndChirpAllCcPorts(), USBPORT_RootHubSCE(), USBPORT_RootHubStandardCommand(), USBPORT_SendSetupPacket(), USBPORT_SetEndpointState(), USBPORT_SetRegistryKeyValue(), USBPORT_SplitBulkInterruptTransfer(), USBPORT_SplitTransfer(), USBPORT_StartDevice(), USBPORT_SynchronizeRootHubCallback(), USBPORT_TestDebugBreak(), USBPORT_TimerDpc(), USBPORT_Unload(), USBPORT_UpdateAllocatedBwTt(), USBPORT_UserGetHcName(), USBPORT_UserGetRootHubName(), USBPORT_Wait(), USBPORT_WorkerRequestDpc(), USBSTOR_CBWCompletionRoutine(), USBSTOR_ConvertToUnicodeString(), USBSTOR_CSWCompletionRoutine(), USBSTOR_DataCompletionRoutine(), USBSTOR_DispatchClose(), USBSTOR_FdoHandlePnp(), USBSTOR_FdoHandleRemoveDevice(), USBSTOR_FdoHandleStartDevice(), USBSTOR_GetEndpointStatus(), USBSTOR_GetMaxLUN(), USBSTOR_HandleDeviceControl(), USBSTOR_HandleExecuteSCSI(), USBSTOR_HandleInternalDeviceControl(), USBSTOR_HandleQueryProperty(), USBSTOR_PdoHandleDeviceRelations(), USBSTOR_PdoHandlePnp(), USBSTOR_PdoHandleQueryCompatibleId(), USBSTOR_PdoHandleQueryDeviceId(), USBSTOR_PdoHandleQueryDeviceText(), USBSTOR_PdoHandleQueryHardwareId(), USBSTOR_PdoHandleQueryInstanceId(), USBSTOR_QueueAddIrp(), USBSTOR_ResetPipeWithHandle(), USBSTOR_SendReadWrite(), USBSTOR_SendRequest(), USBSTOR_StartIo(), UserClientConnect(), UserClientShutdown(), UserExitReactOS(), UserGhostWindowFromHungWindow(), UserLoadImage(), UserpCaptureStringParameters(), UserpGetClientFileName(), UserpMessageBox(), UserProcessCreate(), ValidityCheckSymbols(), VbeService(), VersionInfo32_QueryValue(), vfat8Dot3ToString(), VfatAcquireFileForNtCreateSection(), VfatAcquireForCcFlush(), VfatAcquireForLazyWrite(), VfatAcquireForModWrite(), VfatAllocateIrpContext(), vfatAttachFCBToFileObject(), VfatBlockDeviceIoControl(), VfatBuildRequest(), VfatCheckForDismount(), VfatCleanup(), VfatCleanupFile(), VfatClose(), VfatCloseFile(), VfatCloseWorker(), VfatCreate(), VfatCreateFile(), VfatDirectoryControl(), vfatDirFindFile(), VfatDismountVolume(), VfatDispatchRequest(), VfatDoRequest(), VfatFastIoCheckIfPossible(), VfatFastIoDetachDevice(), VfatFastIoDeviceControl(), VfatFastIoLock(), VfatFastIoQueryBasicInfo(), VfatFastIoQueryNetworkOpenInfo(), VfatFastIoQueryOpen(), VfatFastIoQueryStandardInfo(), VfatFastIoRead(), VfatFastIoReadCompressed(), VfatFastIoUnlockAll(), VfatFastIoUnlockAllByKey(), VfatFastIoUnlockSingle(), VfatFastIoWrite(), VfatFastIoWriteCompressed(), VfatFileSystemControl(), vfatFindDirSpace(), VfatFlushFile(), VfatFlushVolume(), VfatFormat(), VfatGetBasicInformation(), vfatGetFCBForFile(), VfatGetNetworkOpenInformation(), VfatGetPositionInformation(), VfatGetRetrievalPointers(), VfatGetVolumeBitmap(), vfatGrabFCB(), vfatGrabFCBFromTable(), VfatHasFileSystem(), VfatIsVolumeDirty(), VfatLockControl(), VfatLockOrUnlockVolume(), VfatMarkVolumeDirty(), VfatMdlRead(), VfatMdlReadComplete(), VfatMdlReadCompleteCompressed(), VfatMdlWriteComplete(), VfatMdlWriteCompleteCompressed(), VfatMount(), VfatMoveEntry(), VfatMoveFile(), vfatNewFCB(), VfatOpenFile(), VfatPrepareMdlWrite(), vfatPrepareTargetForRename(), VfatQueryInformation(), VfatQueryVolumeInformation(), VfatQueueRequest(), VfatRead(), VfatReadDisk(), VfatReadDiskPartial(), VfatReadFileData(), VfatReadWritePartialCompletion(), vfatReleaseFCB(), VfatReleaseFileForNtCreateSection(), VfatReleaseForCcFlush(), VfatReleaseForModWrite(), VfatReleaseFromLazyWrite(), VfatRenameChildFCB(), vfatRenameEntry(), VfatSetAllocationSizeInformation(), VfatSetBasicInformation(), VfatSetDispositionInformation(), VfatSetInformation(), VfatSetPositionInformation(), VfatSetRenameInformation(), VfatSetVolumeInformation(), VfatShutdown(), VfatUpdateEntry(), vfatUpdateFCB(), VfatVerify(), VfatWrite(), VfatWriteDisk(), VfatWriteDiskPartial(), VfatWriteFileData(), VfatxFormat(), VgaConsoleUpdateTextCursor(), VGADDIFillSolid(), VGADDIPaintRgn(), VgaReadMemory(), VgaReadPort(), VgaVerticalRetrace(), VgaWriteMemory(), VgaWritePort(), VideoPortCreateEvent(), VolumeClassInstaller(), W32kCreateFileSection(), W32kMapViewOfSection(), W32kOpenFile(), WaitForBind(), WaitToReceive(), WaitToSend(), warn(), warning(), WaveThread(), WdmaudAddDevice(), WdmAudCapabilities(), WdmAudCleanup(), WdmAudControlDeviceState(), WdmAudControlDeviceType(), WdmAudControlOpenMixer(), WdmAudDeviceControl(), WdmAudInitWorkerRoutine(), WdmAudMixerInitialize(), WdmAudOpenSysAudioDevices(), WdmAudPnp(), WdmAudResetStream(), WdmAudUnload(), wmain(), wodMessage(), WPUModifyIFSHandle(), WPUQueryBlockingCallback(), WriteAttribute(), CCabinet::WriteCabinetHeader(), WriteConsoleThread(), CCabinet::WriteDataBlock(), CCabinet::WriteDisk(), CCabinet::WriteFileEntries(), WriteFileGather(), CCabinet::WriteFileToScratchStorage(), CCabinet::WriteFolderEntries(), CDFParser::WriteInfLine(), WriteMidi(), WriteMPU(), WritePartitions(), WritePartitionsToDisk(), WriteSoundBlaster(), WriteToSoundBlaster(), WSAAccept(), WSAAddressToStringA(), WSAAddressToStringW(), WSAAsyncGetHostByAddr(), WSAAsyncGetHostByName(), WSAAsyncGetProtoByName(), WSAAsyncGetProtoByNumber(), WSAAsyncGetServByName(), WSAAsyncGetServByPort(), WSAAsyncSelect(), WSACancelAsyncRequest(), WSACancelBlockingCall(), WSACleanup(), WSAConnect(), WSADuplicateSocketA(), WSADuplicateSocketW(), WSAEnumNameSpaceProvidersA(), WSAEnumNameSpaceProvidersInternal(), WSAEnumNameSpaceProvidersW(), WSAEnumNetworkEvents(), WSAEnumProtocolsA(), WSAEnumProtocolsW(), WSAGetOverlappedResult(), WSAGetQOSByName(), WSAGetServiceClassInfoA(), WSAGetServiceClassInfoW(), WSAGetServiceClassNameByClassIdA(), WSAGetServiceClassNameByClassIdW(), WSAHtonl(), WSAHtons(), WSAInstallServiceClassA(), WSAInstallServiceClassW(), WSAIoctl(), WSAIsBlocking(), WSAJoinLeaf(), WSALookupServiceBeginA(), WSALookupServiceBeginW(), WSALookupServiceEnd(), WSALookupServiceNextA(), WSALookupServiceNextW(), WSANSPIoctl(), WSANtohl(), WSANtohs(), WSAProviderConfigChange(), WSApSetPostRoutine(), WSARecv(), WSARecvDisconnect(), WSARecvFrom(), WSARemoveServiceClass(), WSASend(), WSASendDisconnect(), WSASendTo(), WSASetBlockingHook(), WSASetServiceA(), WSASetServiceW(), WSASocketW(), WSAStartup(), WSAStringToAddressA(), WSAStringToAddressW(), WSAUnhookBlockingHook(), WSCEnumProtocols(), WSCGetProviderPath(), WSHIoctl_GetInterfaceList(), WSHNotify(), WSHOpenSocket2(), WSHSetSocketInformation(), WsTcGetEntryFromTriplet(), WsTcLoadProvider(), WsTpInitialize(), wWinMain(), xHalIoAssignDriveLetters(), xHalIoReadPartitionTable(), xHalpGetRDiskCount(), xHalQueryDriveLayout(), XIPInit(), CMiniportDMusUART::~CMiniportDMusUART(), and CMiniportDMusUARTStream::~CMiniportDMusUARTStream(). Definition at line 65 of file polytest.cpp. Referenced by HTMLScreen_Create(), main(), putpixel(), test_GetSystemMetrics(), and test_screen().